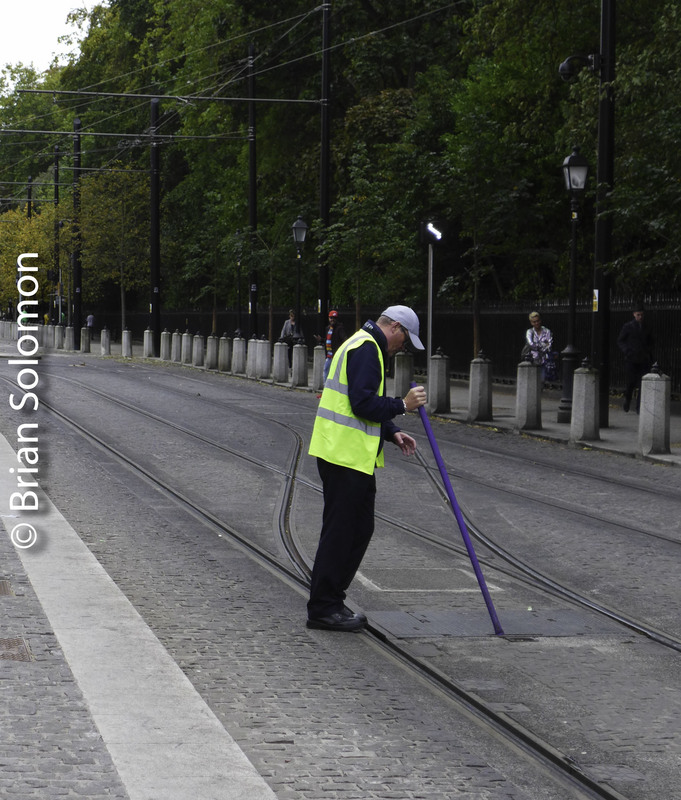 Sunny Saturday: Colourful Tram Works LUAS Green Line on Dawson Street—3 photos. 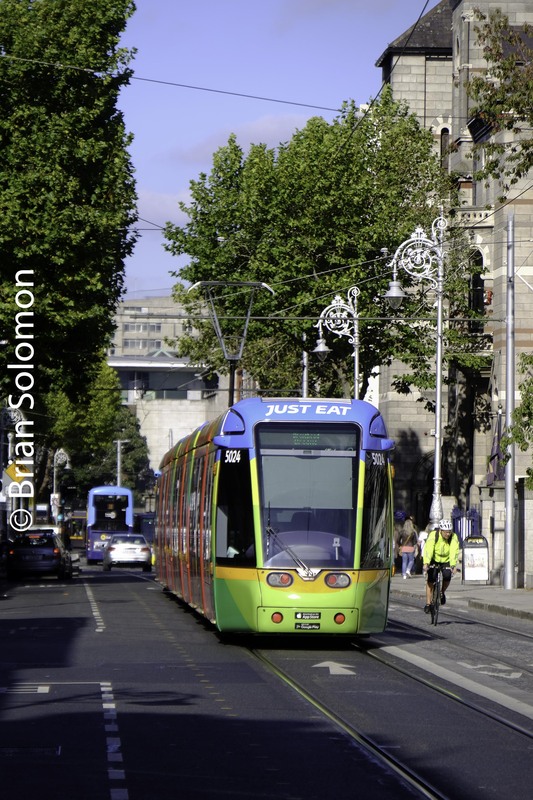 Yesterday, 29 September 2018, I made these views of a LUAS Green Line tram wearing the latest fully covered advertising livery as it worked up Dawson Street in Dublin on its way to Broombridge. September often brings sunny days in Ireland, and yesterday was a fine afternoon to make a few photos. 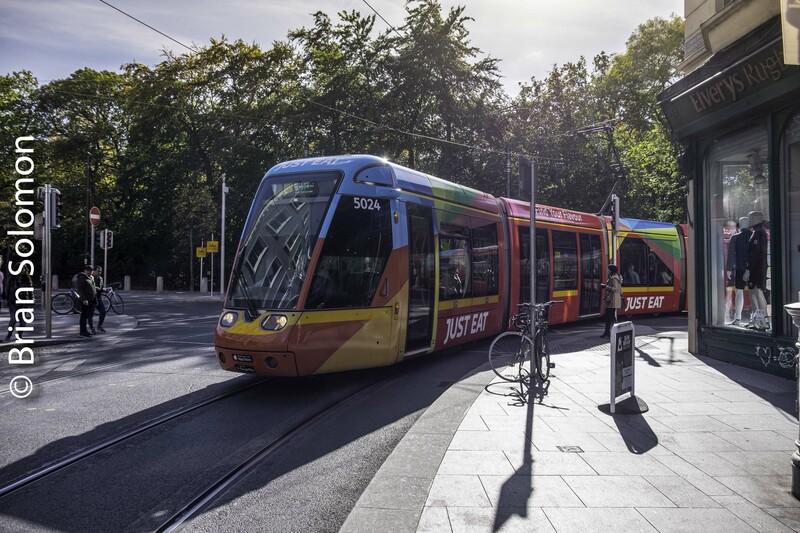 This encounter with the colourful tram was fortuitous, rather than planned, as I was on a shopping mission and photography was a secondary activity. Photo adjusted from the camera RAW in post processing. All the images were exposed using my FujiFilm XT1 with 18-135mm zoom lens. 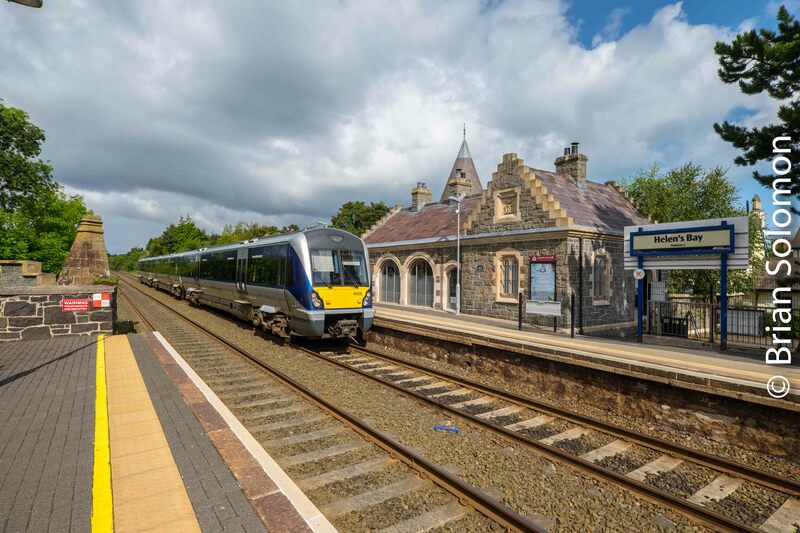 NI Railways 3021 at Cultra, Co. Down. No, not on display. Not yet! This was a service train. 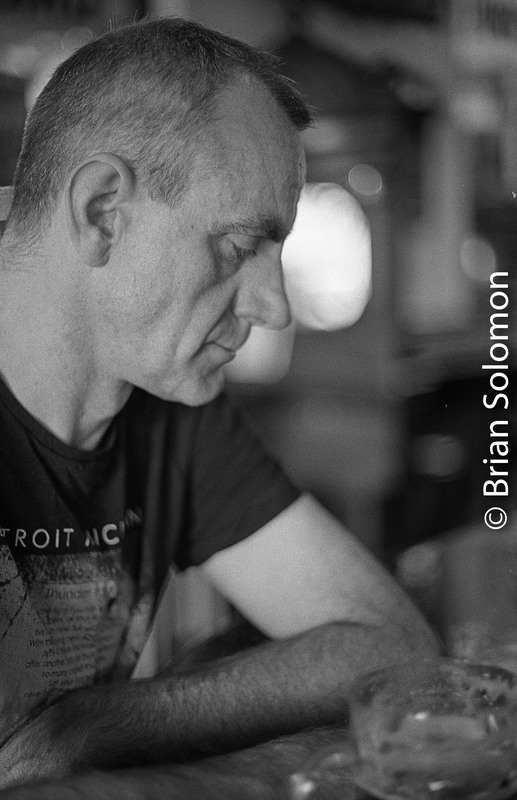 My choice of film is a bit obsolete: Fuji Acros 100. I have a few rolls left in my bag. Afterwards, I hand processed in a Paterson tank with Rodinal Special mixed 1 to 31 with water for 3 minutes 45 second at 68F. 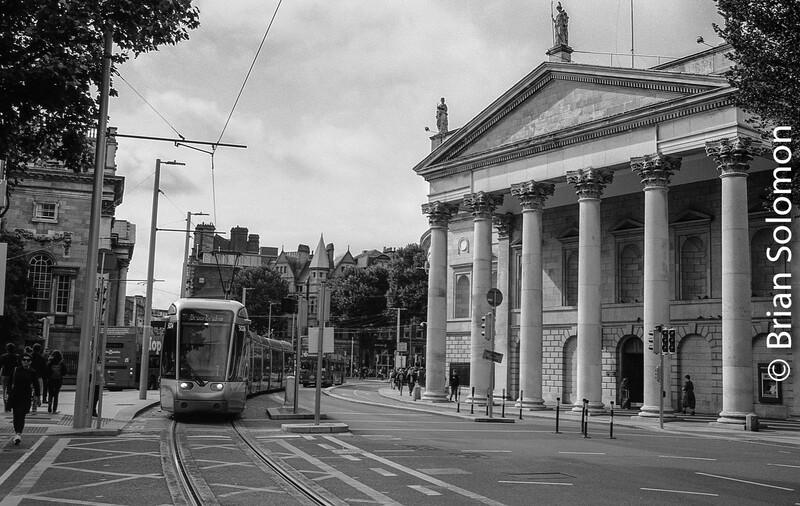 Dublin’s College Green with Tram—Fuji Acros 100. 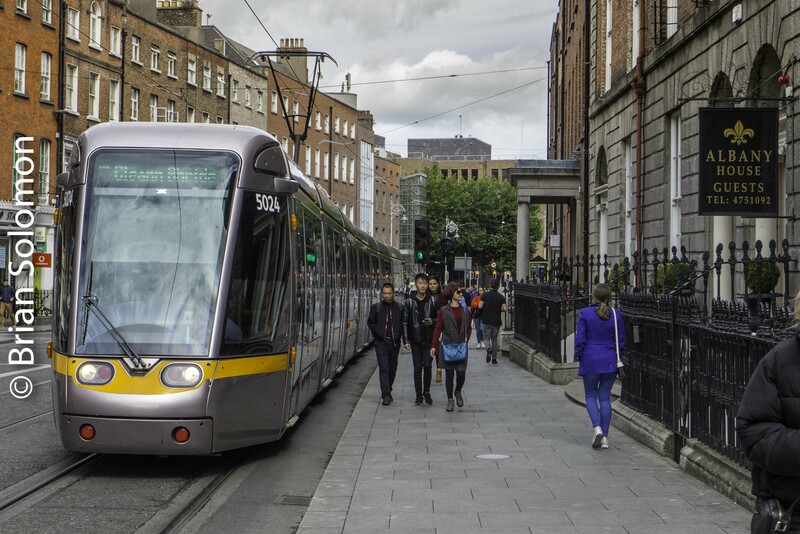 The Green Line Cross City extension cuts through College Green, one of Dublin’s most pictured intersections. 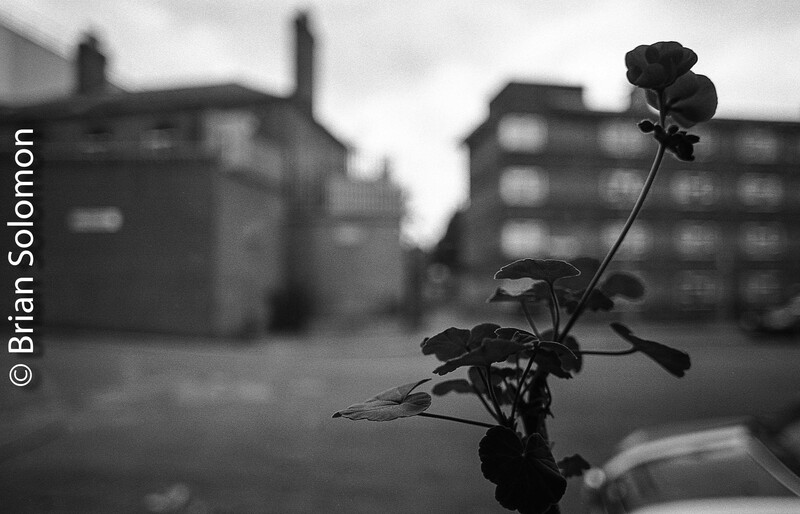 I made this view in August 2018 using my Canon EOS 3 with 40mm lens on Fuji Acros 100 black & white film. This I processed by hand in a Paterson tank using Rodinal Special liquid developer concentrate mixed 1 to 31 with water for 3 minutes 45 second at 68F. The negatives were scanned with an Epson V500 flatbed scanner, and contrast was nominally adjusted in post processing to make for a more pleasing digitally presented image. College Green, Dublin. On the left is Trinity College, on the right is the Bank of Ireland which occupies buildings designed in the 18th century for the Irish Parliament. 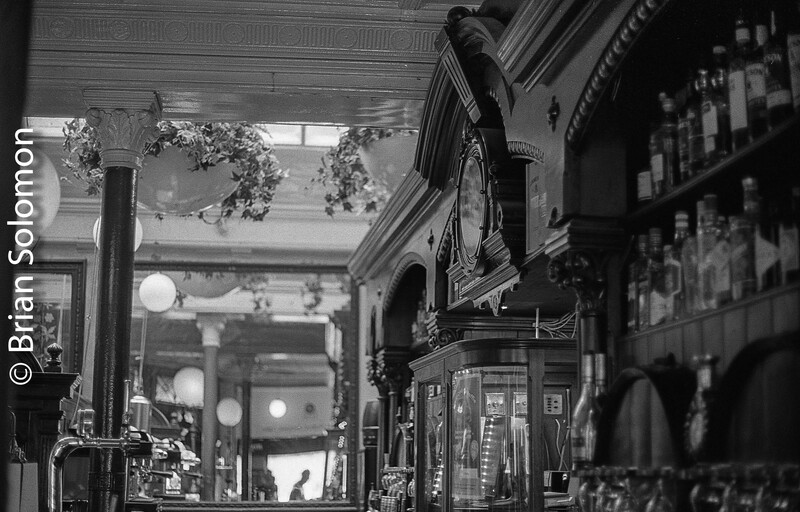 Dublin Pub Immortalized on Tri-X-And yes there’s a Railroad Photo too. 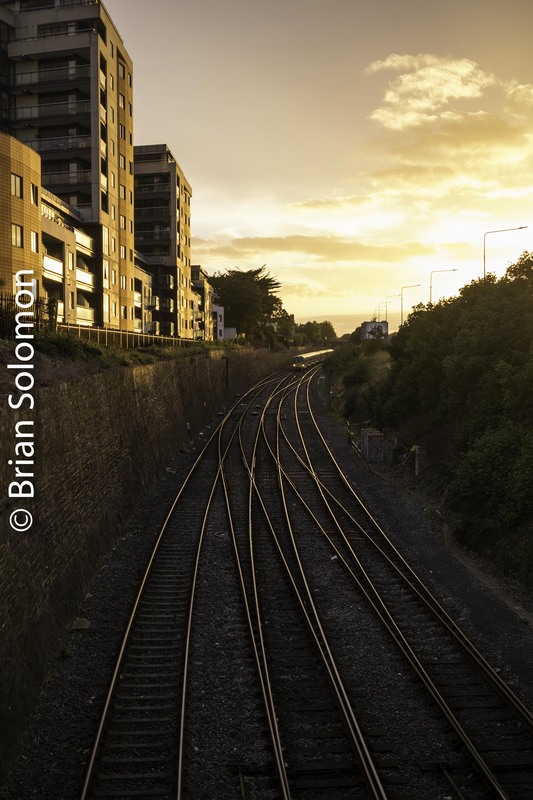 Several days ago, two Dublin photographers and I converged on the Conyngham Road, where Irish Rail’s branch from Islandbridge Junction to Connolly Station/North Wall enters the Phoenix Park Tunnel. 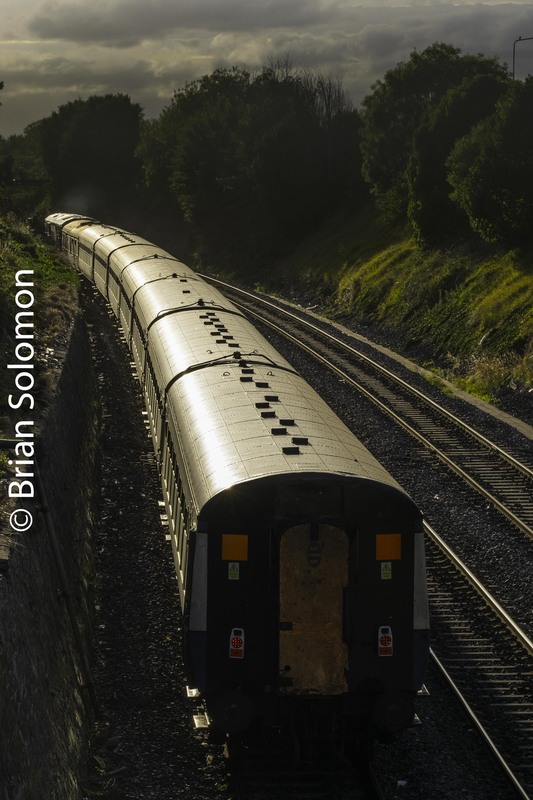 Our interest was Belmond’s Grand Hibernianled by an Irish Rail class 071 diesel. 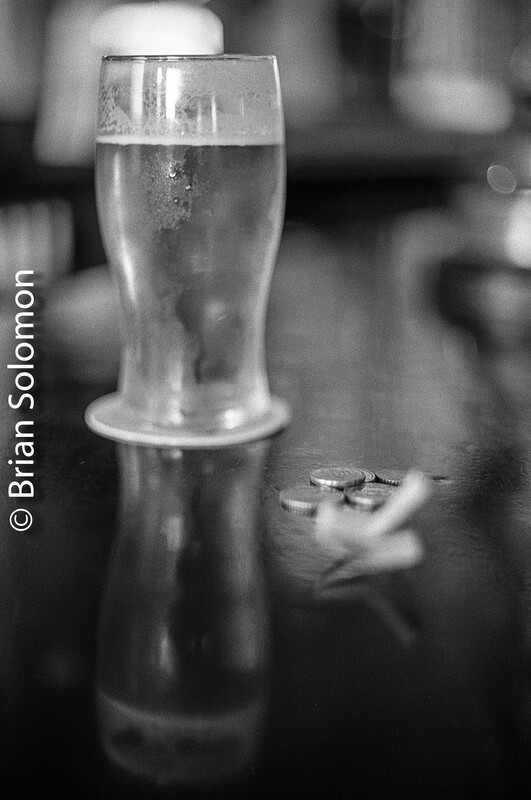 Afterwards we paid a visit to Ryan’s of Parkgate Street, a local pub just a short walk up the street and near Dublin’s Heuston Station, where I continued to make photos with my vintage Nikon F3 with 50mm f1.4 lens. Working with a wide aperture on film allows for selective focus and the ability to select a subject and offset it against a soft background. This the opposite effect often provided by many digital cameras that tend to use a smaller aperture and sharpening software to produce greater depth of field and razor sharp images. 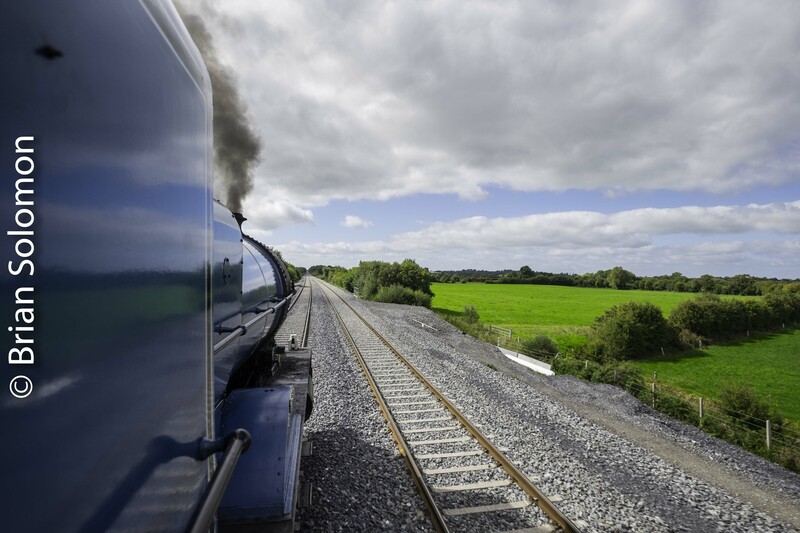 Belmond’s Grand Hibernian heads for Dublin Connolly Station. 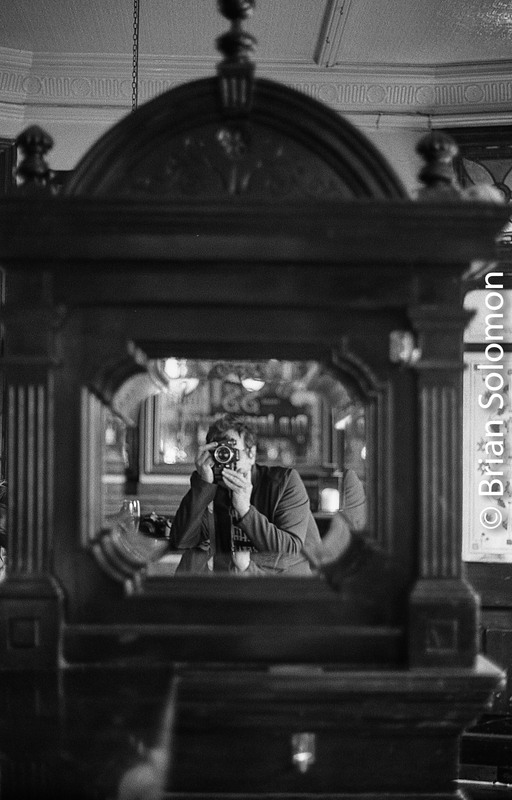 Kodak Tri-X exposed with a Nikon F3 with 50mm lens. I used Kodak Tri-X, which I processed in Ilford ID-11 using a traditional recipe with my customized multiple-split process to maximize shadow and highlight detail. 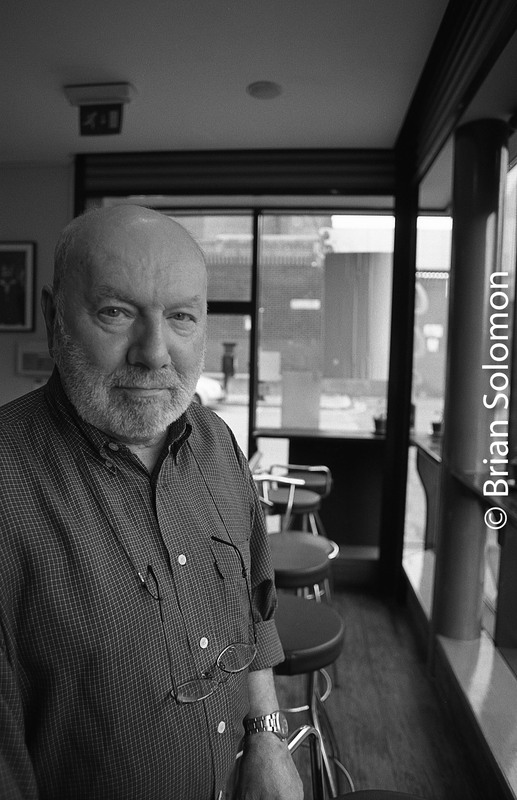 Two Weeks from Tonight: In Cork City, Brian Solomon Slide Presentation. The talk will be held at the Bru Columbanus Meeting Rooms in Wilton, Cork City. This is about a two to five minute walk from Wilton Shopping centre. 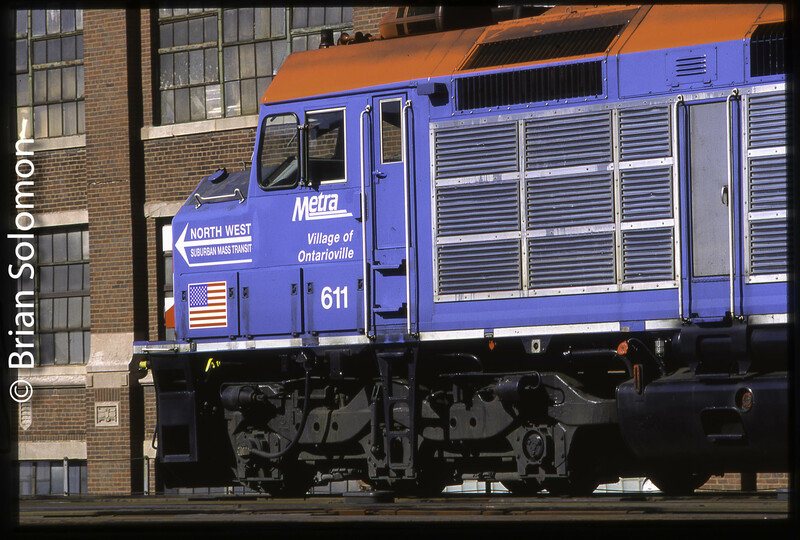 A Chicago Metra F40C at Tower A2 in Chicago. Twin Cities & Western at Hoffman Avenue, St. Paul, Minnesota. January 13, 1994. 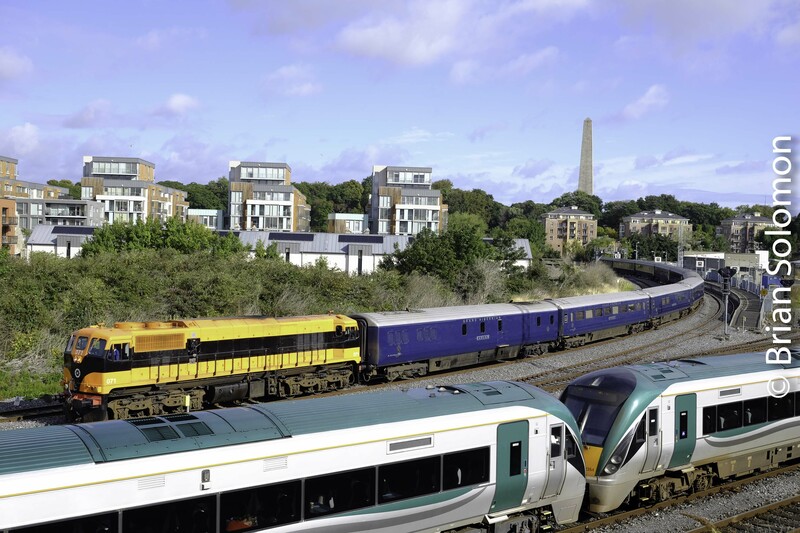 Irish Rail 071 Leads the Grand Hibernian—Variations on a Theme. 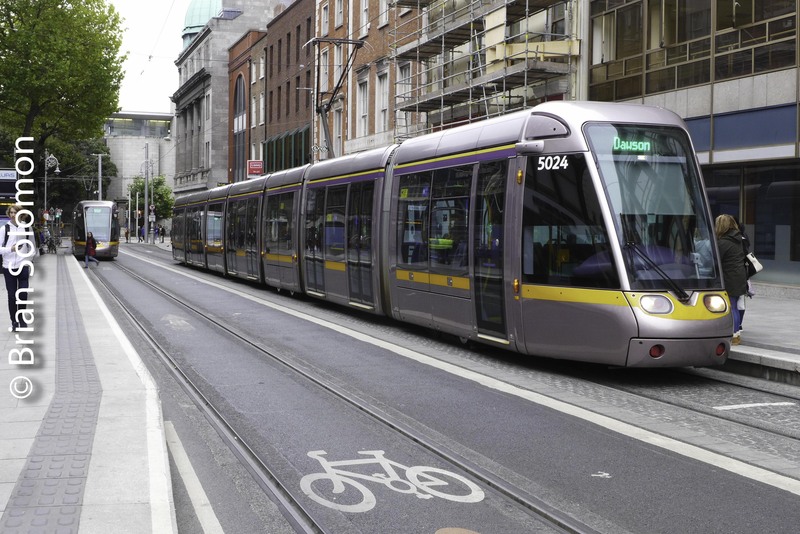 I’ve been unusually fortunate to catch Irish Rail’s 071 almost everyday for the last couple of weeks. 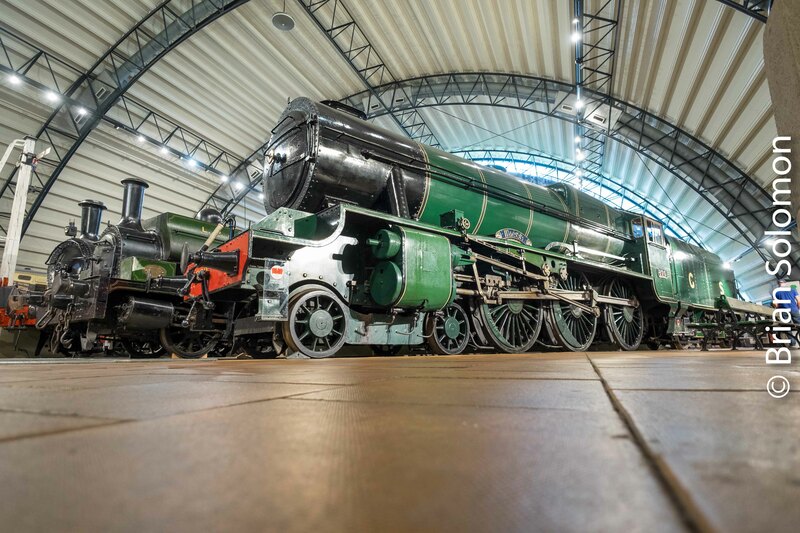 This locomotive is the class leader and features a heritage livery based on the as-delivered General Motors scheme. It is very popular with photographers. 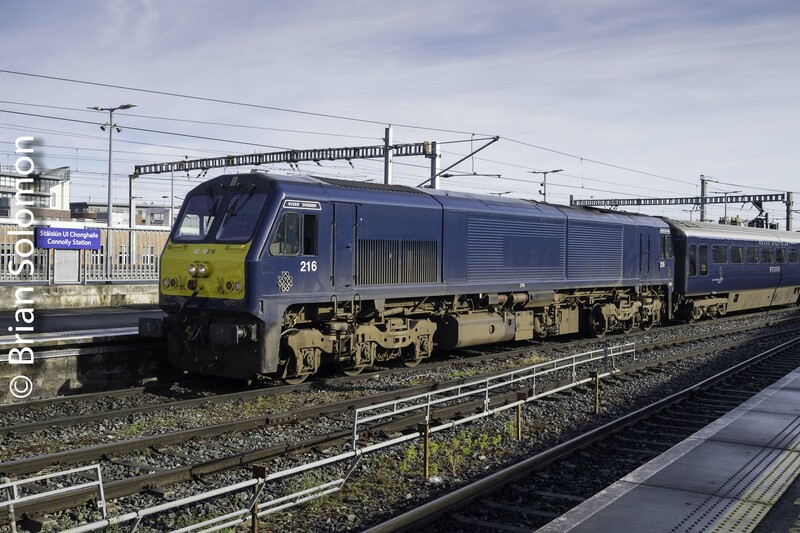 On Saturday 22 September 2018, locomotive 071 worked the Belmond Grand Hibernian cruise train from Dublin Heuston to Connolly Station. 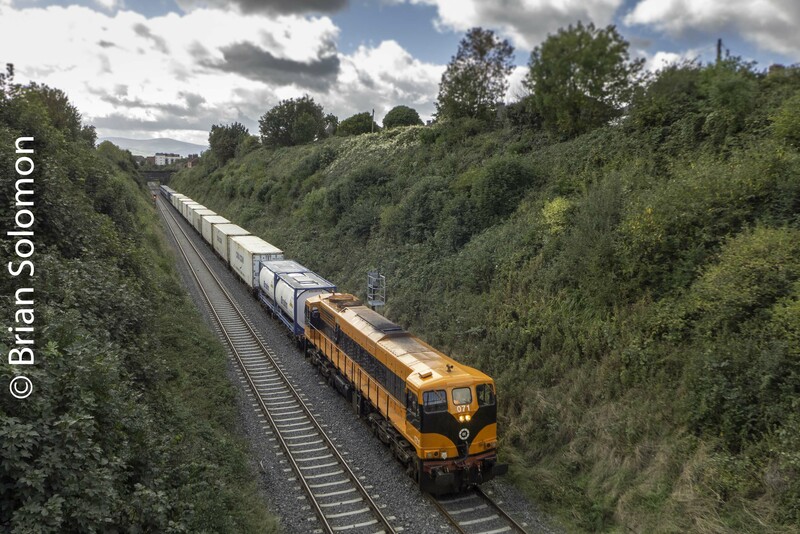 Until yesterday, it had been assigned to the Dublin-Ballina IWT Liner container train. To make this view, I used my FujiFilm XT1 fitted with a Zeiss Touit 12mm lens. To help bring in sky detail, I attached a Lee 0.9 graduated neutral density filter (a physical filter), then made further adjustment to RAW files in post processing using a digitally applied graduated neutral density filter, which allowed me to make adjustments to highlight and shadow detail. Additional adjustments were made globally (the entire image) to modify contrast and colour saturation to improve the appearance of the photograph. 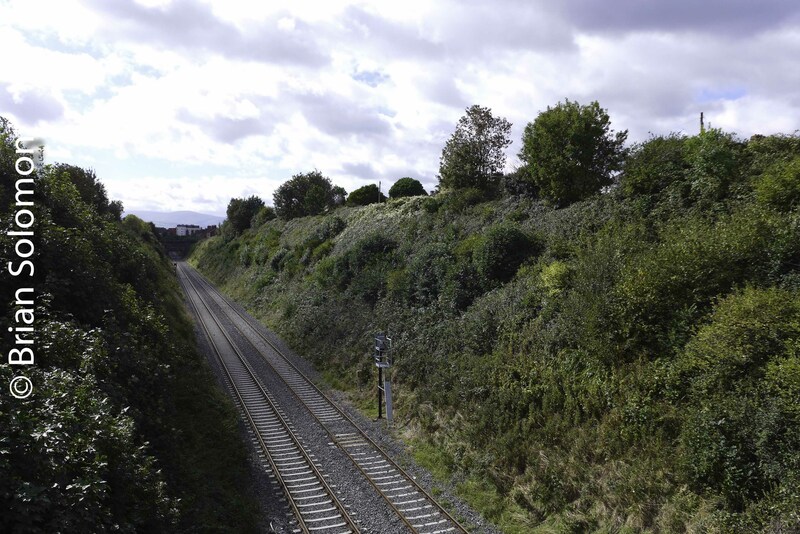 A view from Dublin’s Conyngham Road above the south portal of the Phoenix Park Tunnel on the branch that runs from Islandbridge Junction toward Connolly Station. 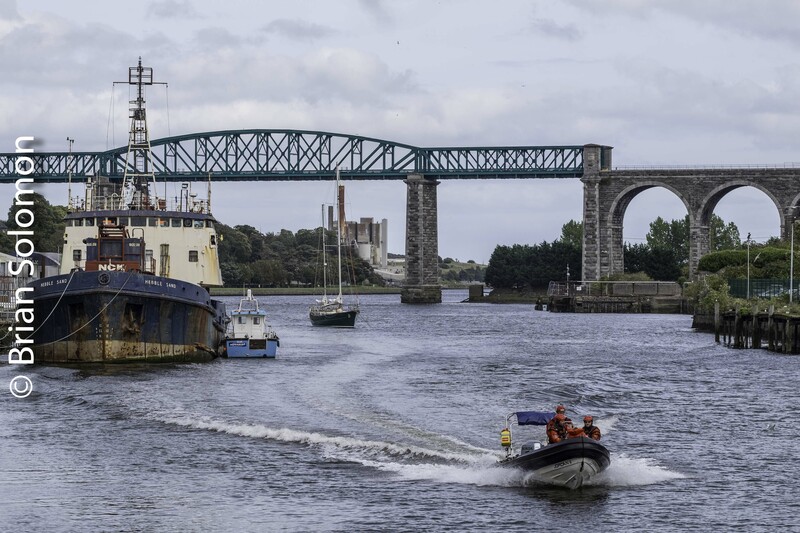 Northern Ireland Railways at River Foyle Peacebridge. 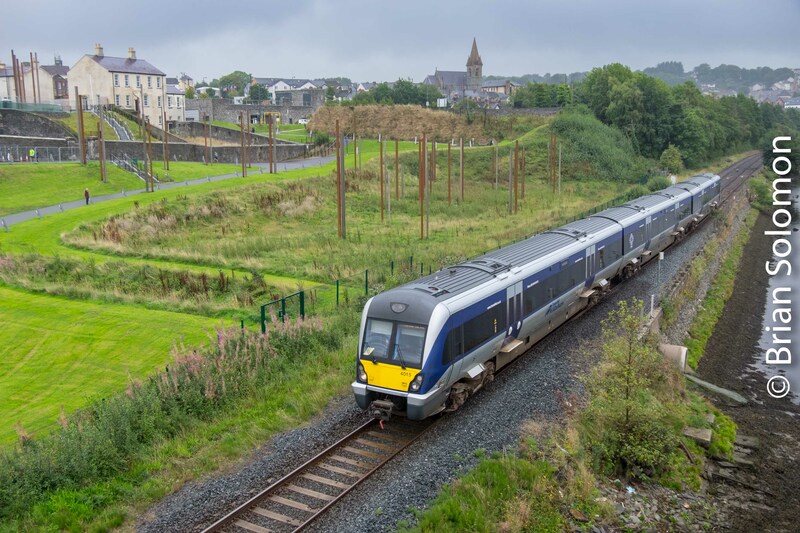 I arrived from Belfast on this Northern Ireland Railways 4000-series diesel railcar. 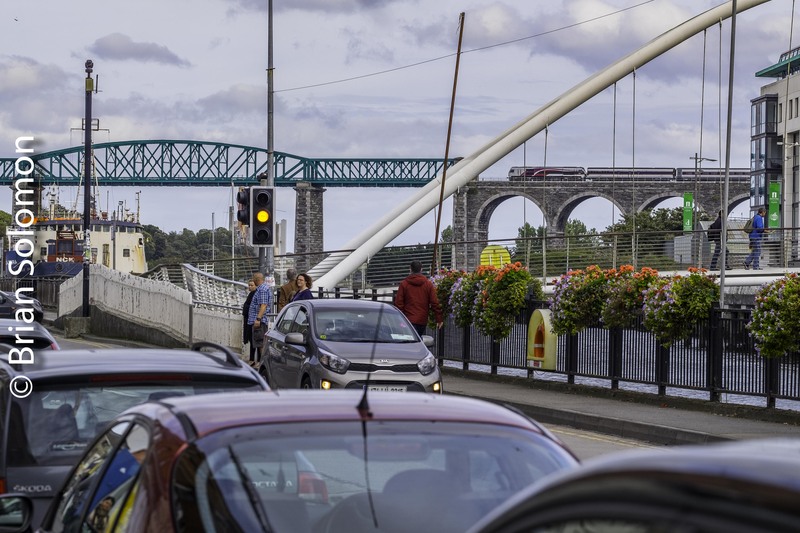 With a little more than ten minutes before the train began its return journey from the Derry/Londonderry Station, I hoofed to the pedestrian Peacebridge over the River Foyle to make this photograph. Although overcast, it was bright, but very windy. The view from the Derry/Londonderry Peace Bridge. Exposed using a FujiFilm XT1 with 18-135mm lens set at 23.5mm; ISO 400, 1/500 second, f5.0. 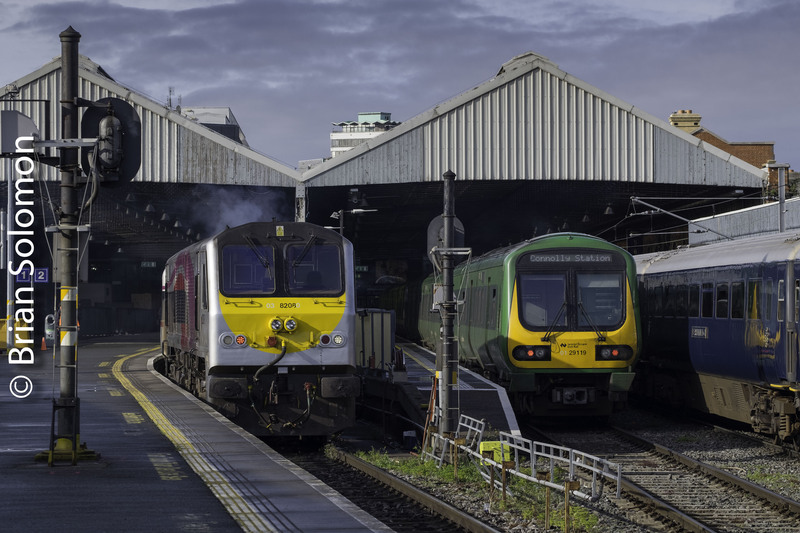 Sunday, 16 September 2018 found unusual variety at Irish Rail’s Dublin Connolly Station. 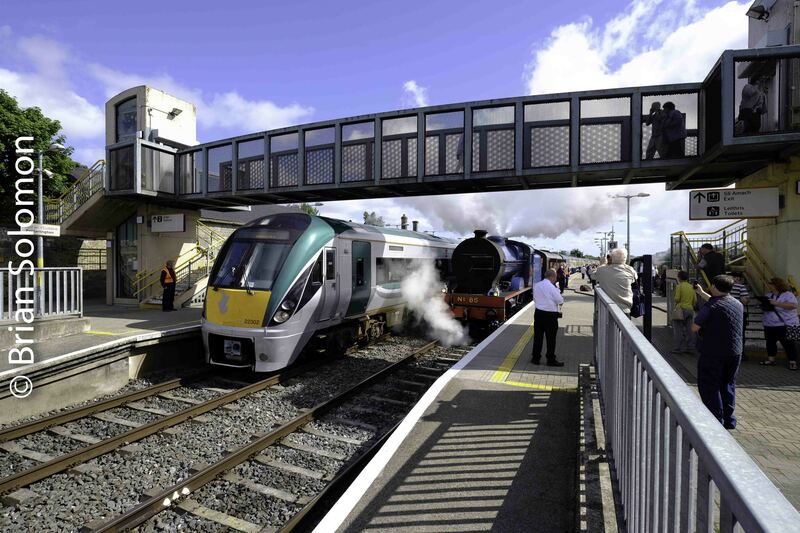 Adding colour to Irish Rail’s parade of local and long distance trains was Belmond’s Grand Hibernian that arrived from Dundalk, and departed a half an hour later bound for Waterford. 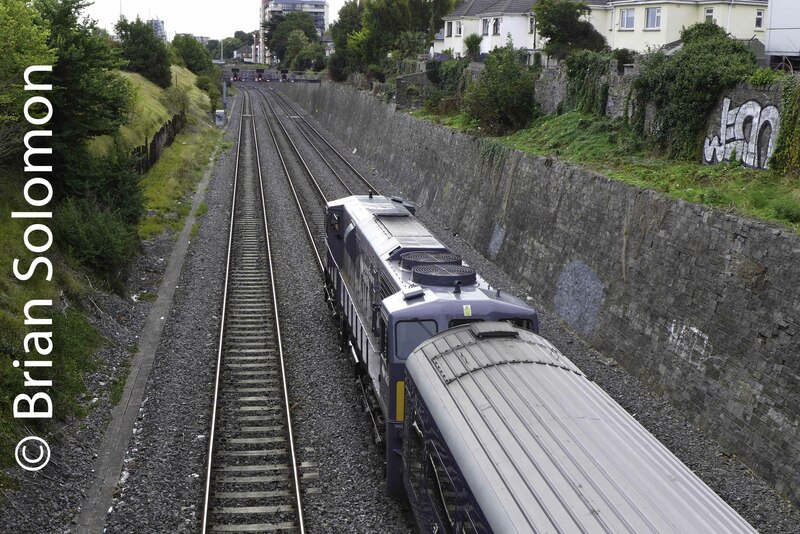 As this high-end cruise train was departing, a HOBS (ballast train) was heading from the northern line into the North Wall with Irish Rail 077. 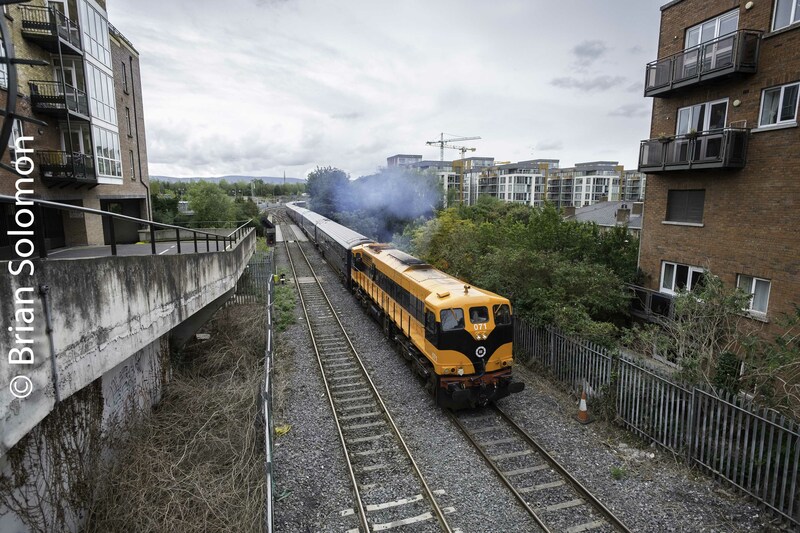 But the most unusual train was Rail Preservation Society of Ireland’s heritage Cravens, which arrived from Inchicore behind one of Northern Ireland Railways Enterprise class 201 diesels. 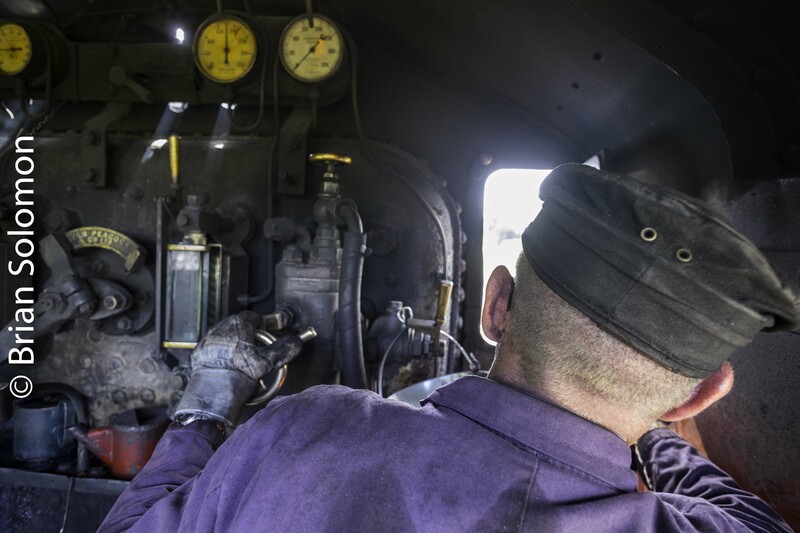 While the train was expected, the locomotive was a surprise. 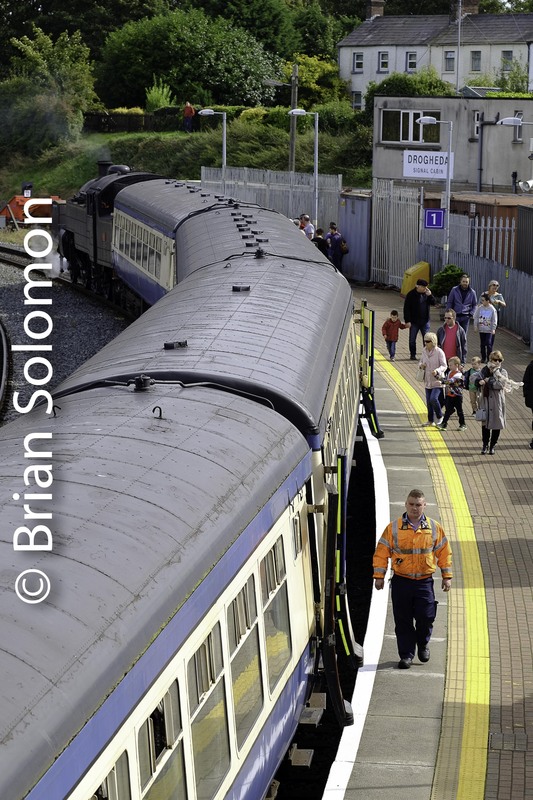 Belmond’s Grand Hibernian arrives at Connolly station led by the specially painted Irish Rail 216. 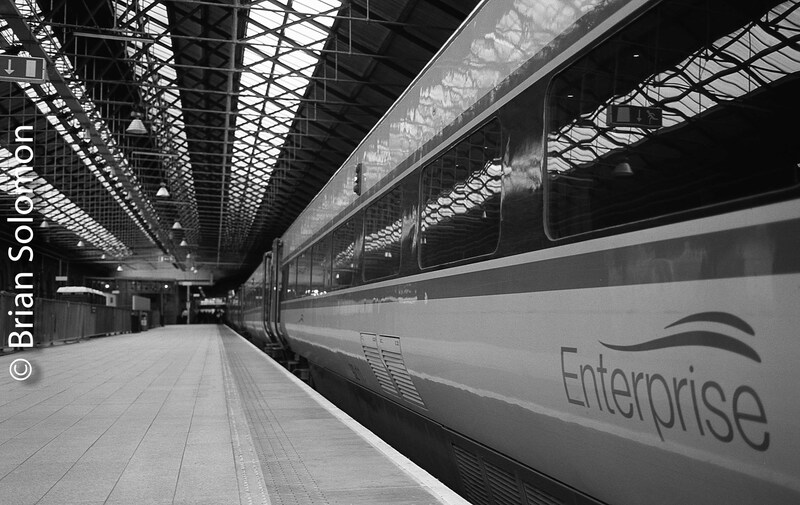 Dublin-Belfast Enterprise is on platform 2, a 29000-series CAF railcar is on platform 3, and the Belmond train on 4. 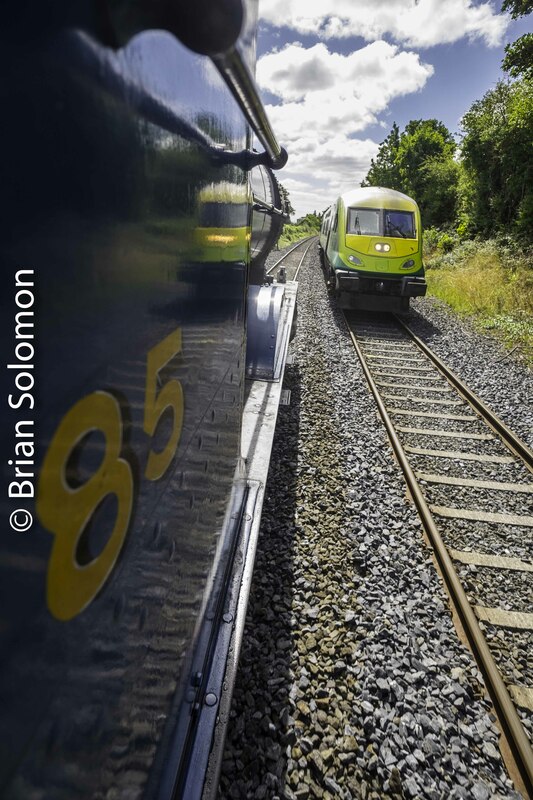 The 10am Enterprise departs as Irish Rail 083 has coupled up to the Belmond for the trip to Waterford. 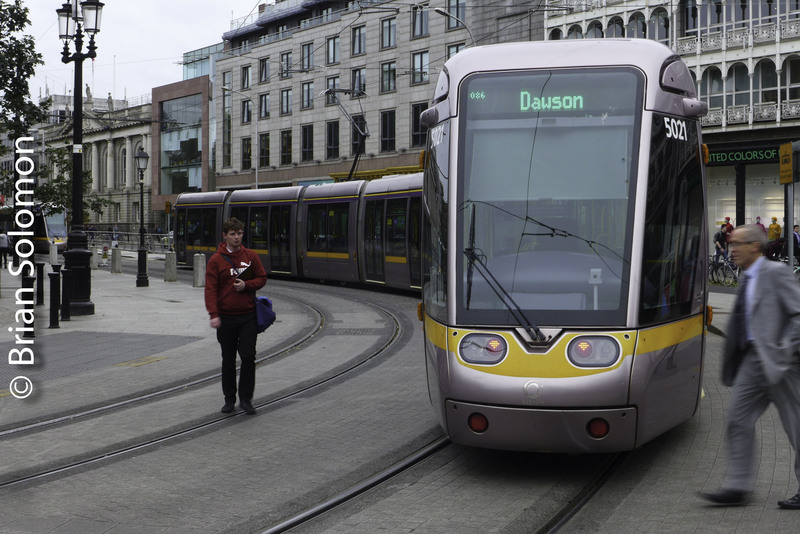 A DART suburban train accelerates away from Connolly. I wasn’t expecting this combination! 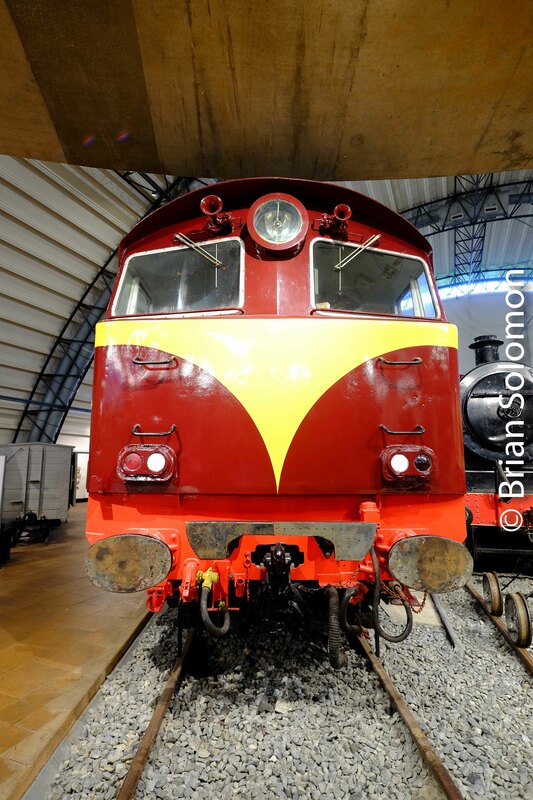 One of NIR’s Enterprise painted 201s with the RPSI heritage train. You can’t be two places at one time! 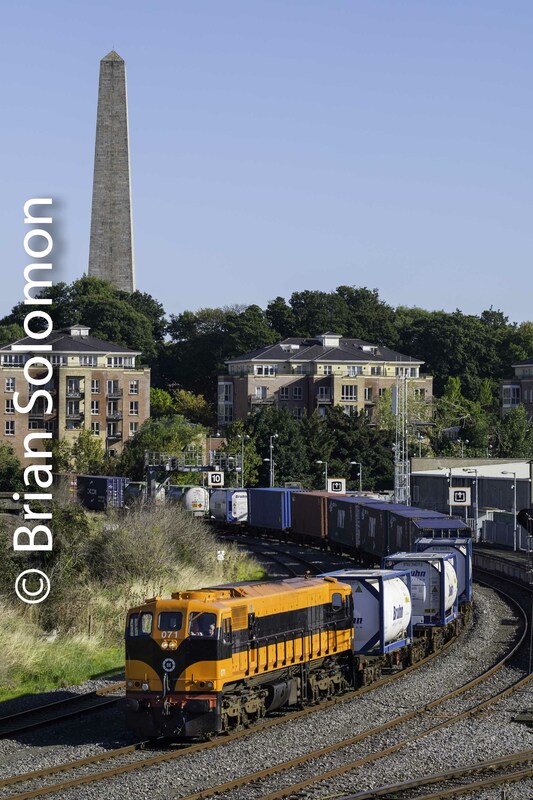 But here we have a photographers conundrum, Belmond’s Sunday departure for Waterford occurred as a the more elusive HOBS (ballast train) takes the switch at East Wall Junction for Dublin’s North Wall. 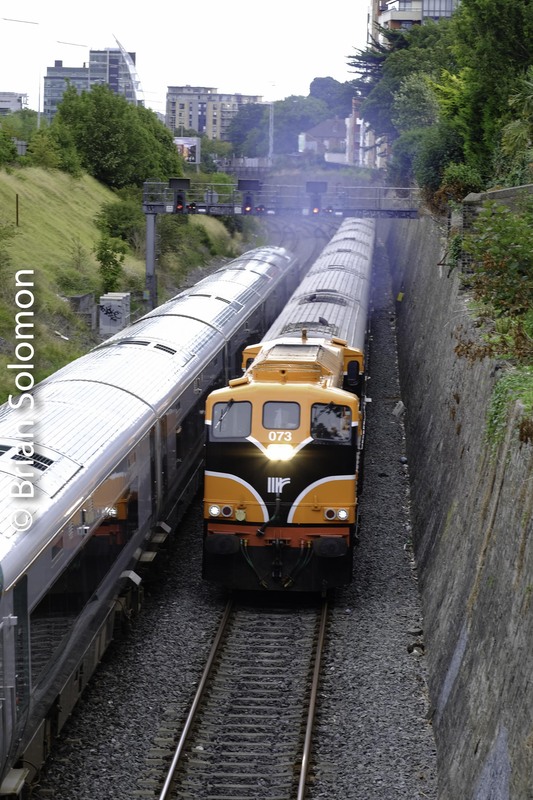 (notice the 071 diesel at far right). 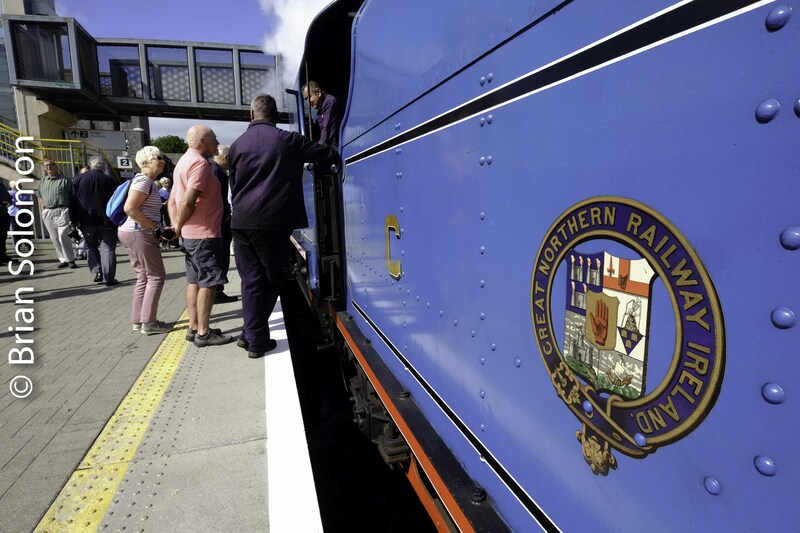 I departed for points north before steam locomotive number 4 arrived to take the scheduled RPSI excursion from platform 5. 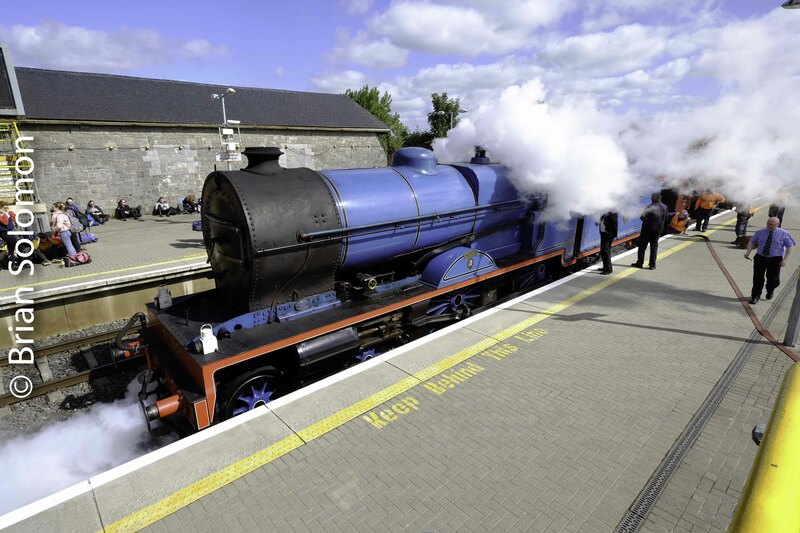 All the while, engine 85 in Great Northern blue, which was intended for the day’s RPSI excursion was stuck on Connolly’s turntable! 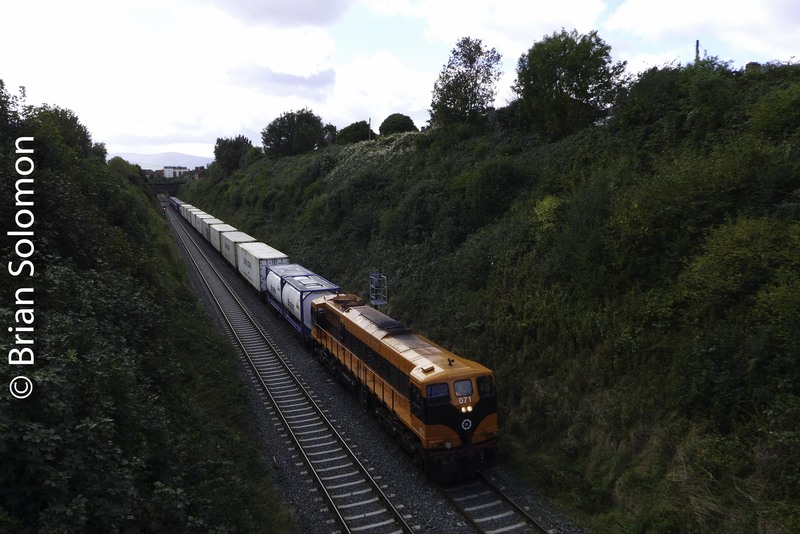 Friday, 21 September 2018, I knew that Irish Rail 071 would be working the up IWT Liner. 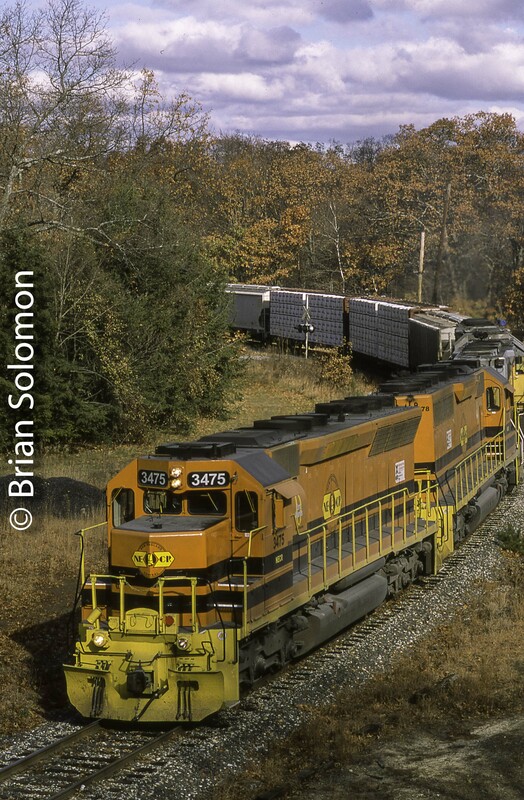 This bright orange locomotive would allow me to make a dramatic photo in a situation where a grey or silver locomotive wouldn’t be as effective. Selecting my vantage point from the Old Cabra Road in Dublin, I faced an unusually contrasty situation. Dramatic fluffly clouds were racing across the sky, rapidly alternating between bright backlit sun and a relatively dark scene with a distant bright sky. To make the most of this, I used my Lumix LX7 to make a couple of test photos. Then opted to under expose my final photo by about 1/3 of stop. This would allow me to retain a bit of detail in the sky, which I could then adjust in post processing. My first test shot. This is a Jpg made without contrast, colour, or other image adjustment taken directly from the Camera RAW file. My second test shot; from the camera Jpg without post processing. This is the unmodified camera Jpg. Notice the relative darkness of the cutting compared with the sky. The final photos required several steps of adjustment to the RAW file. 2) I warmed up the overall colour temperature to counter act the prevalent blue light as result of the heavy shadows. 5) A radial filter was applied to the front of the engine to lighten it slightly. 6) I increased the overall colour saturation slightly to counter the effects of dull lighting in the cutting. 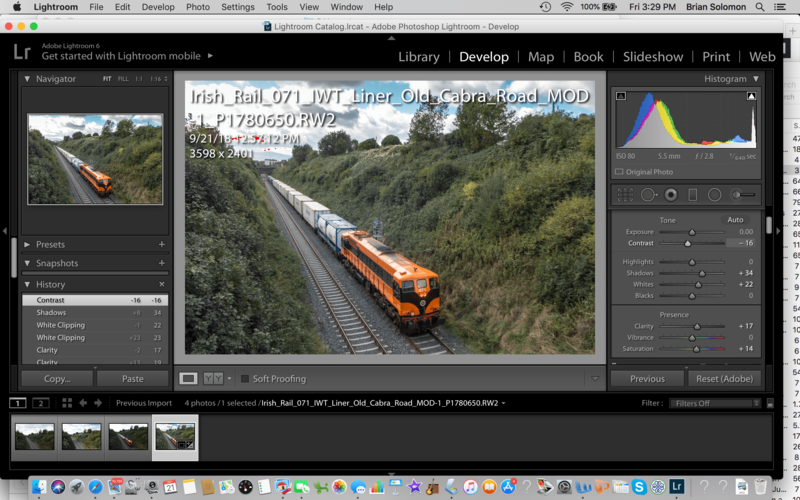 Screen shot of the Lightroom work window for my first adjusted version of the RAW image. My first attempt at modifying the RAW image. My second modified RAW file. This one is warmer and involved a second graduated neutral density filter to enhance the sky. Enterprising the Boyne or BIG BRIDGE tiny train. 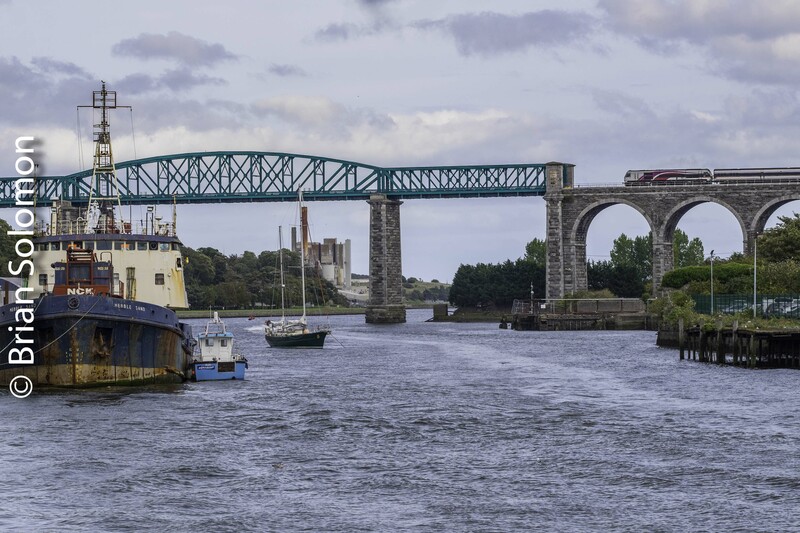 Irish Rail’s lofty Boyne bridge spanning the river and valley of the historic Boyne at Drogheda poses a visual conundrum. This prominent span rises high above Drogheda. It is a very impressive bridge. But it’s difficult to adequately picture a train on it. Feature the bridge; the train is lost. Feature the train; the bridge gets cropped. Look up at the bridge; and the train is marginalized. Stand back to take in the whole span of the bridge and the train becomes insignificant. Place the train at the center of the bridge and it become lost in the iron work. 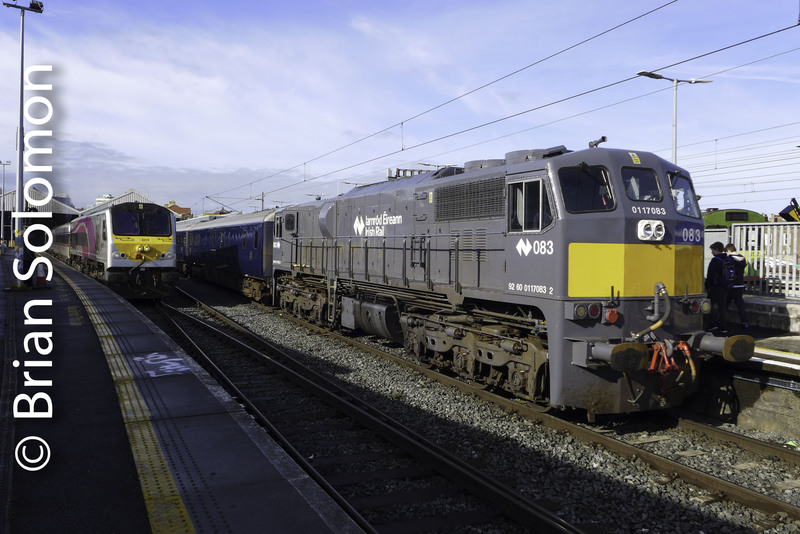 Complicating matters, the only regularly scheduled trains with locomotives are the cross-border Belfast-Dublin Enterpriseservices, and on these train the locomotives always face north. Last Sunday, I made these views of up and down Enterpriseconsists at Drogheda. 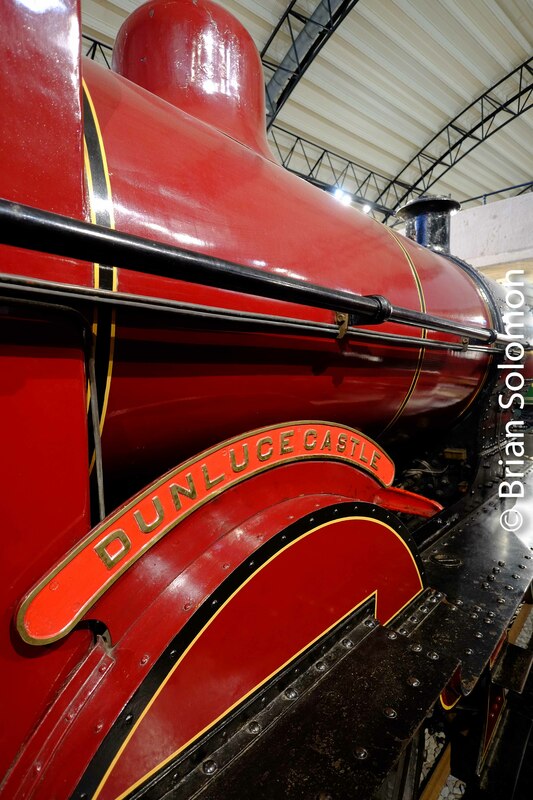 Steam at Drogheda—Sunday, 16 September 2018; Five Digital Photos. 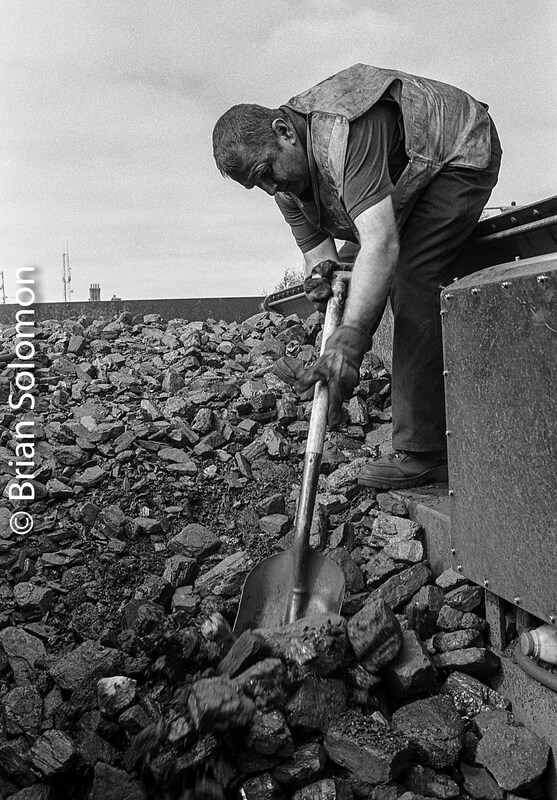 Working with two digital cameras, I made these images at Irish Rail’s Drogheda Station. 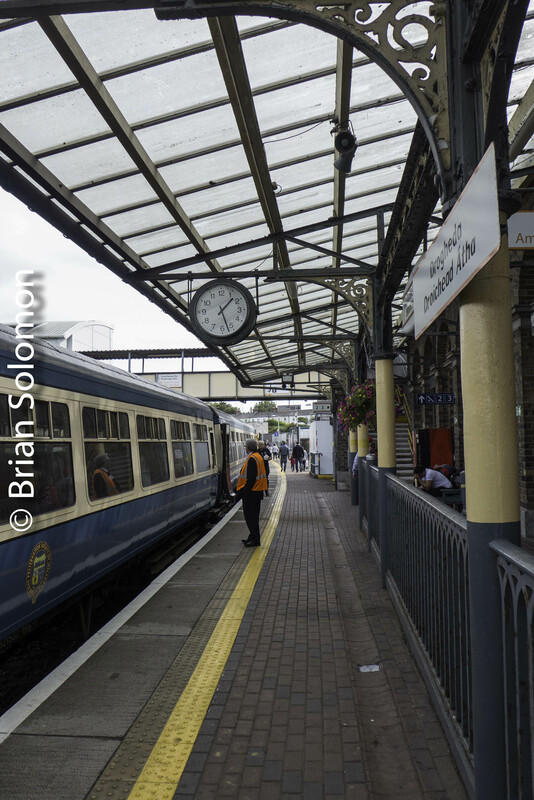 This is a classic Great Northern Railway (Ireland) railway station with a curved platform, antique brick buildings and elegant old-school platform canopies. But it also features more modern elements too, such as palisade fencing and a diesel railcar depot and wash.
Is it honest to exclude the modern elements and just focus on the antique? Or is it better to allow for mix of new and old? After all the photos were made digitally in 2018, not on film in the days of yore. 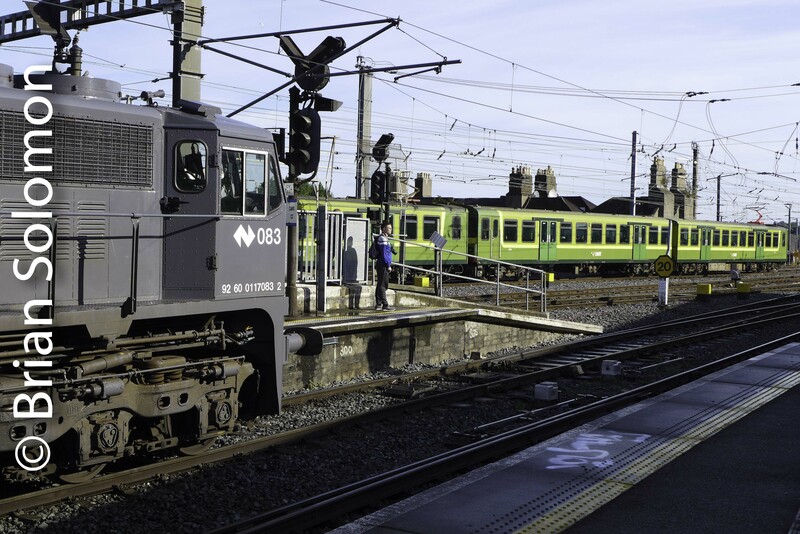 RPSI’s Cravens carriages are paused on the platform at Drogheda. 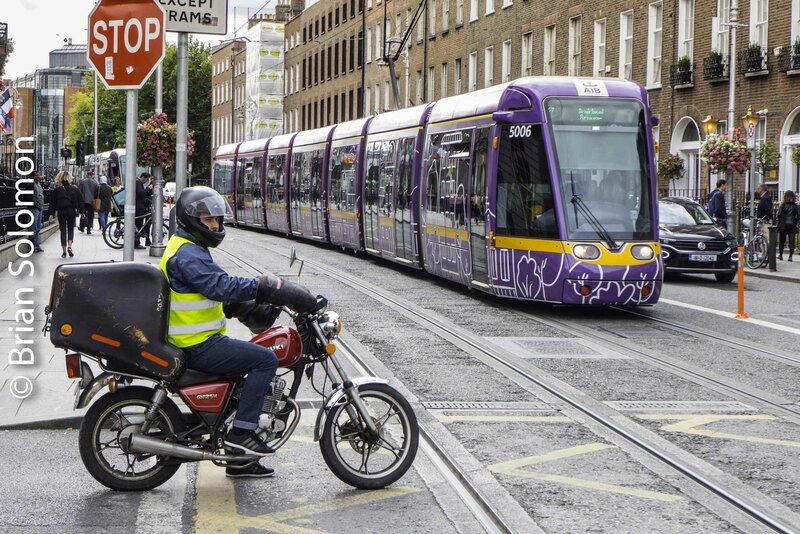 How do you feel about the orange safety vests and modern signage? Telephoto view looking toward Dublin from the footbridge. There’s a vintage signal display at Drogheda station on the platform. 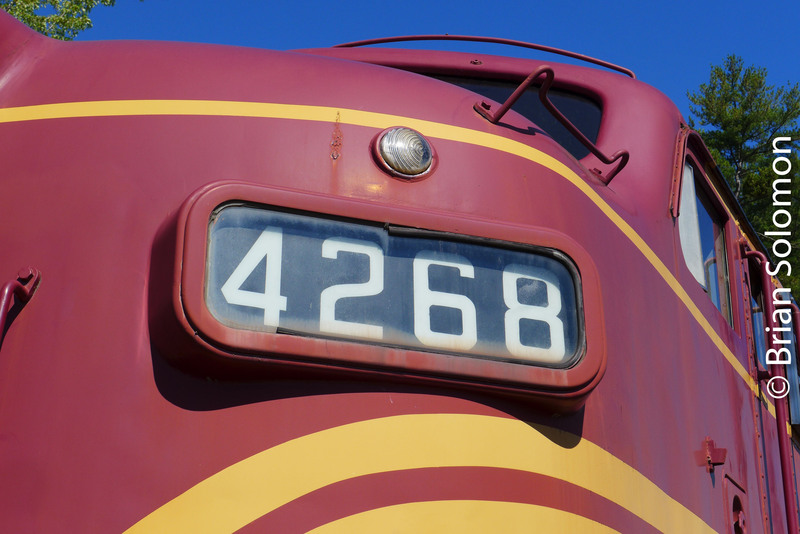 Detail of engine number 4. So how about the Nike footwear at the top of the image? Drogheda signal cabin lacks the classic charm of its Victorian ancestors, but it is part of the modern scene, so there it is! Tracking the Light Posts EVERYDAY to discusses Photographic Technique and Process. In the Shadow of the Old Canal: Black & White Views of Coopers Cafe. It’s been decades since the old Grand Canal Harbour behind the Guinness Brewery was drained and filled in. Dublin’s Guinness brewery had an historic relationship with the Grand Canal. The old canal harbour was located across the street from the brewery complex. The old Harbour Bar takes its name from the Grand Canal Harbour. The canal buildings are at the far right of this image. Recently, I explored this area on my way over to visit Coopers Cafe operated by my friends Jeff and Noel Brennan. 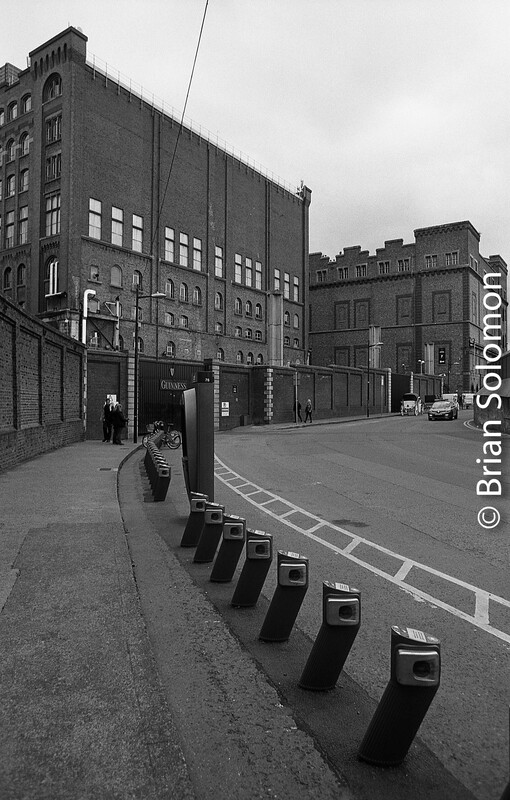 This is on the edge Dublin’s Liberties, an industrial neighborhood with a lot of history. Today, it’s up and coming, although many of the neat gritty old buildings remain. 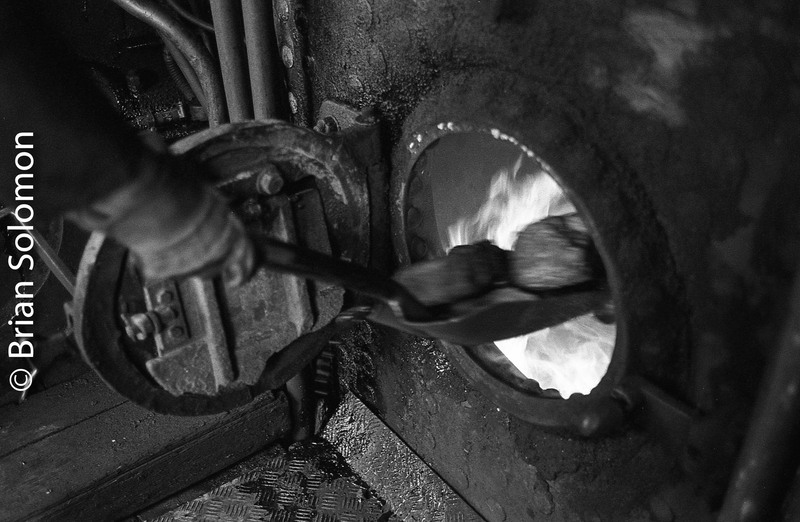 Photos exposed on Ilford FP4 using a Nikon F3 with 24mm Nikkor lens. 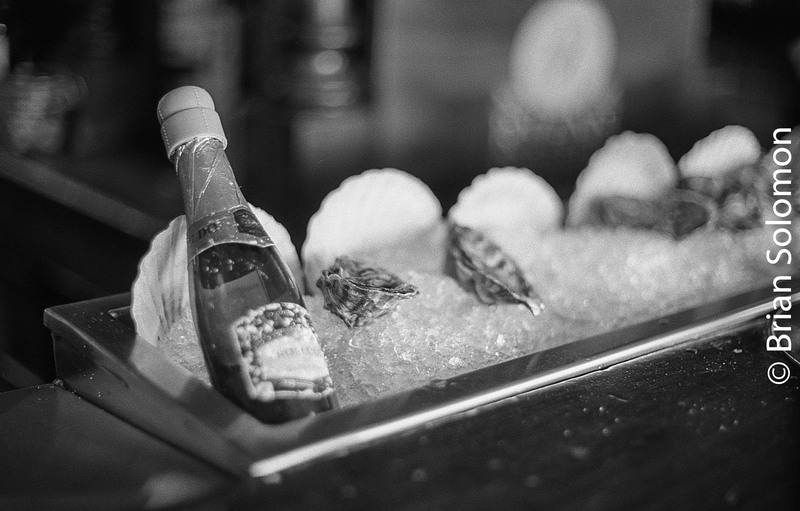 Processed in Ilford ID11 using a customized recipe. 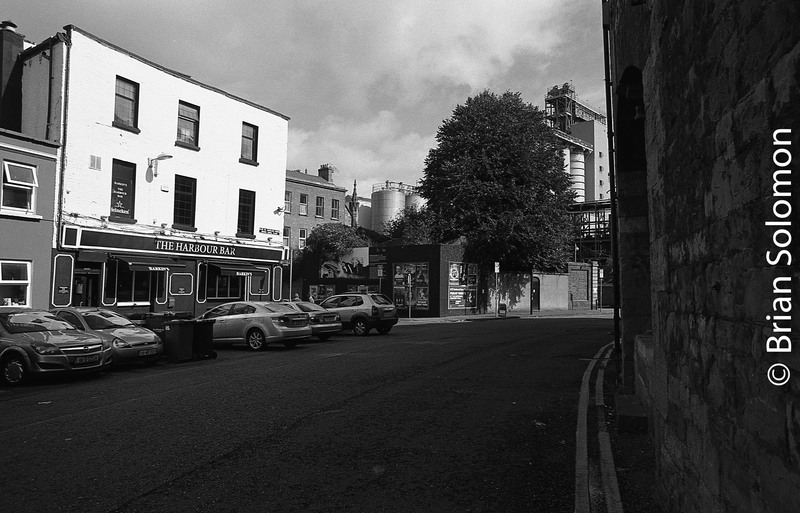 Coopers Cafe is located directly behind the Guinness brewery on the corner of Bond and Robert Streets. 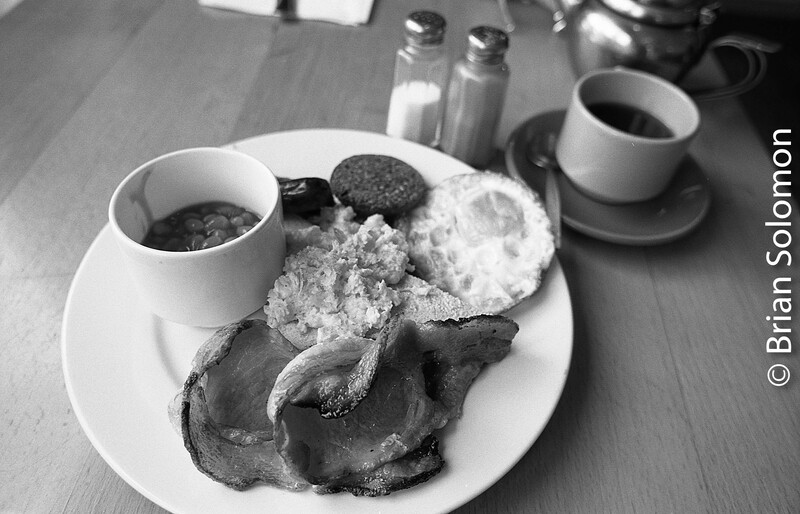 Breakfast is served anytime from opening till closing. I had mine at 2pm. There’s a lot of history around Coopers Cafe. Come in, have a coffee or tea and soak in the atmosphere! Tracking the Light Posts Daily, sometimes twice. 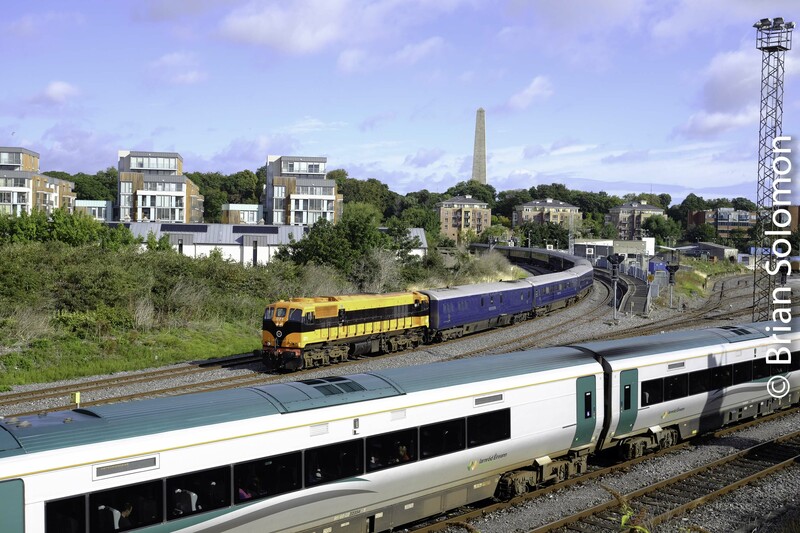 Mix and Unmatched at the Gullet—Variety on Irish Rail. 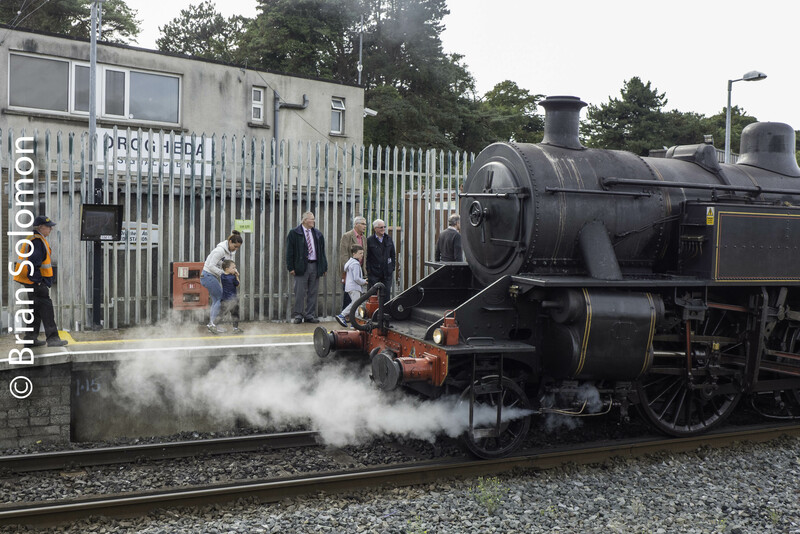 Who said that Irish Rail is boring? Patience and being-there can make the difference. 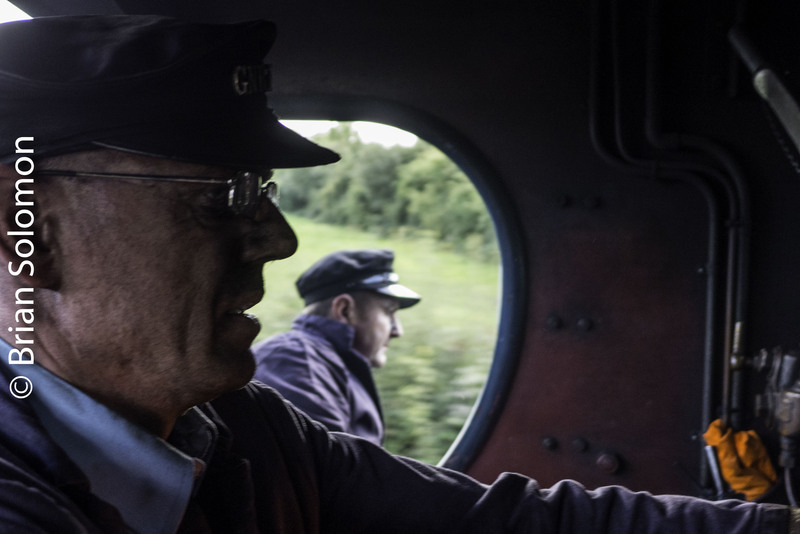 On the Evening of 16 September 2018, the Railway Preservation Society Ireland’s Cravens transfer (train i.d. 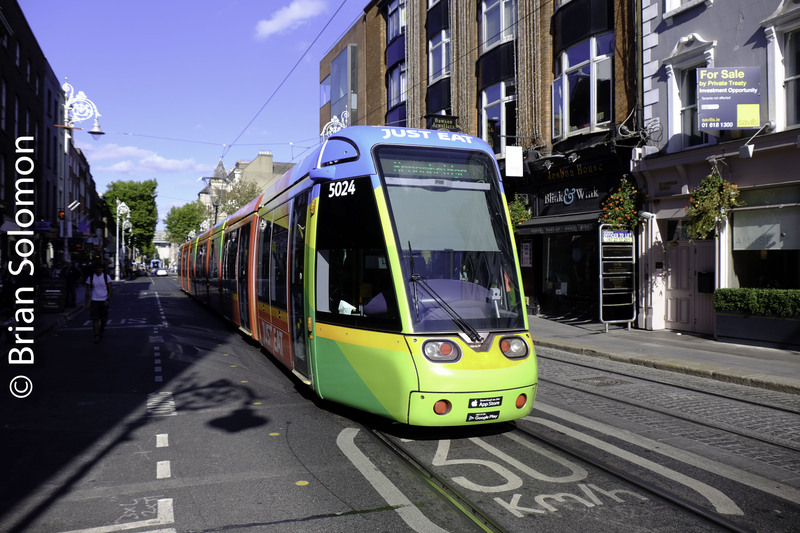 H260) ran from Connolly to Irish Rail’s Inchicore Works. 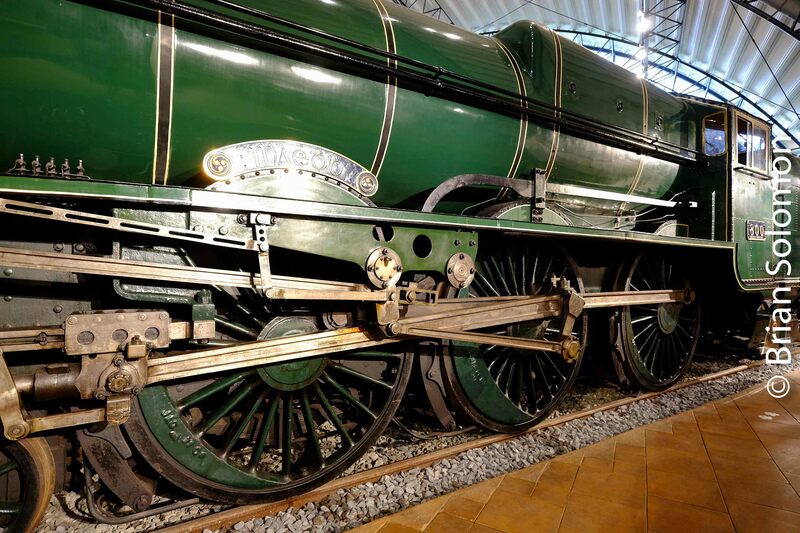 Rather than run with an 071 class locomotive, as is often the case, it was assigned locomotive 216 specially painted for Belmond’s Grand Hibernian. Gullet glint! 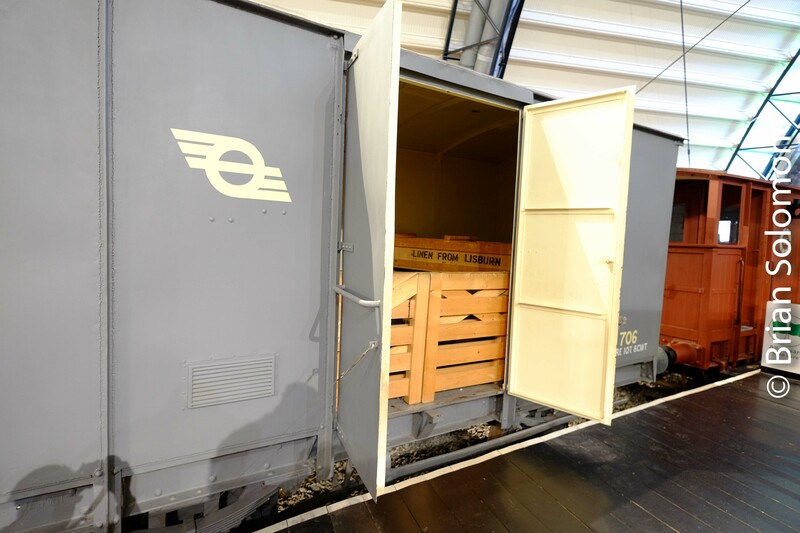 Trailing view of RPSI’s Cravens transfer. Exposed with a FujiFilm XT1 with 90mm lens. The following morning, the up Grand Hibernianfrom Waterford passed the same location with Irish Rail class 071 number 083 in the lead. While Belmond’s train often runs to and from Waterford with an 071 class locomotive, this still presents a bit variety on a railway that tends to favour uniform train sets. 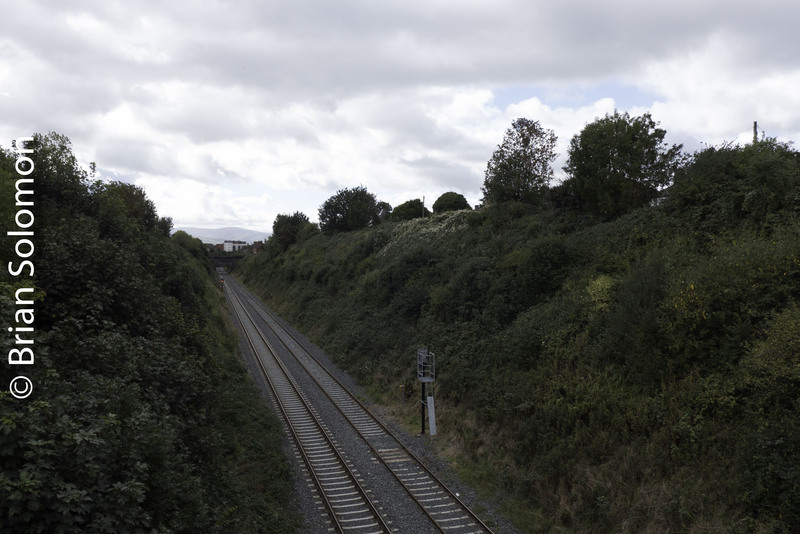 All of these photos were exposed at ‘The Gullet” (the three track throat to Islandbridge Junction) from Memorial Road in Dublin. Trailing view looking toward Islandbridge. Exposed with a Lumix LX7. 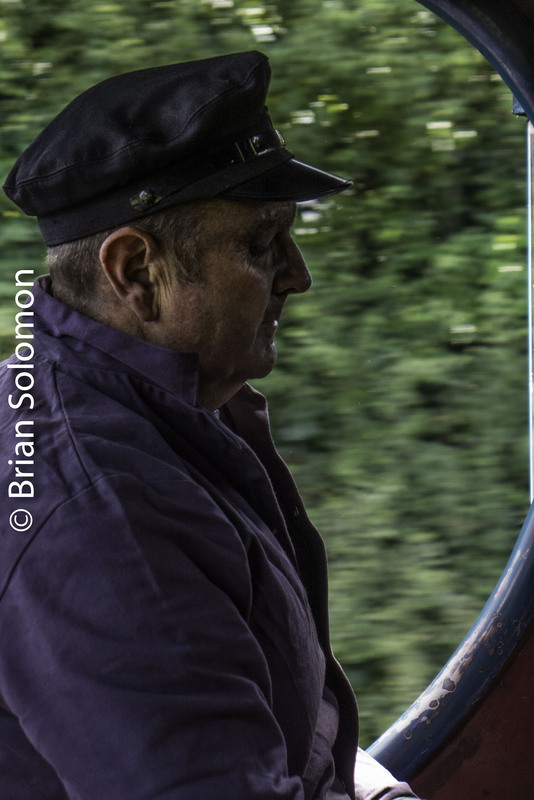 Below are a selection of contemporary digital photographs that I made on visits to the Ulster Folk & Transport Museum at Cultra, near Belfast, Northern Ireland. 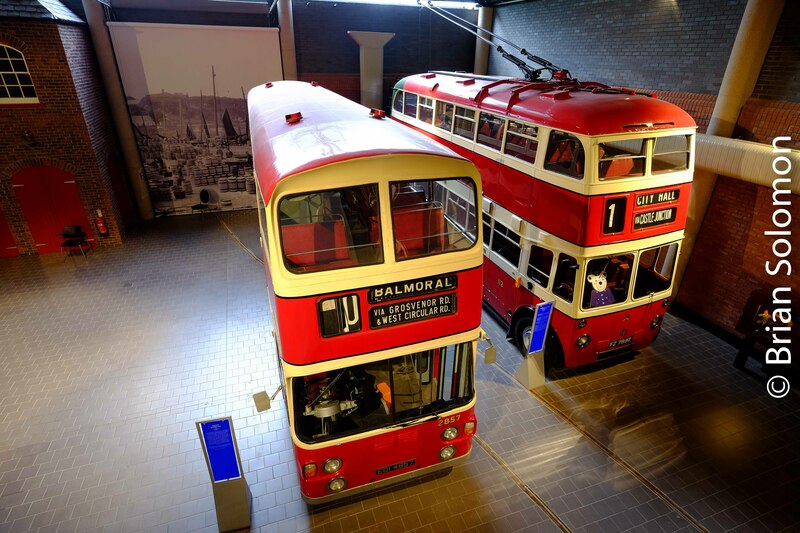 Museums offer opportunity to study historic equipment and take in the spirit of earlier times. But can be challenging places to make captivating photos. Confined quarters, cluttered arrangements, and other visitors can complicate composition. Contrasty mixed source lighting is another problem. Thankfully modern digital cameras do an excellent job of balancing florescent, incandescent light with direct and indirect daylight. 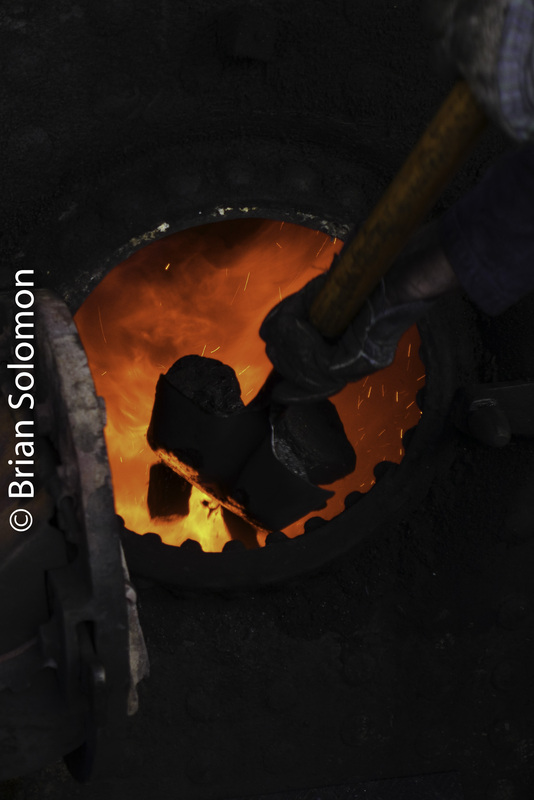 While the ability to make test shots helps to obtain better exposures. 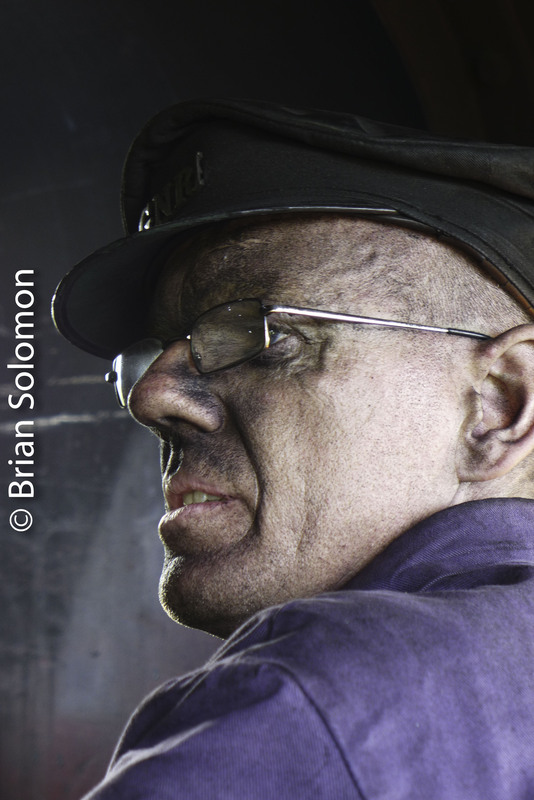 I exposed these images using my FujiFilm XT1 with a 12mm Zeiss Touit lens. 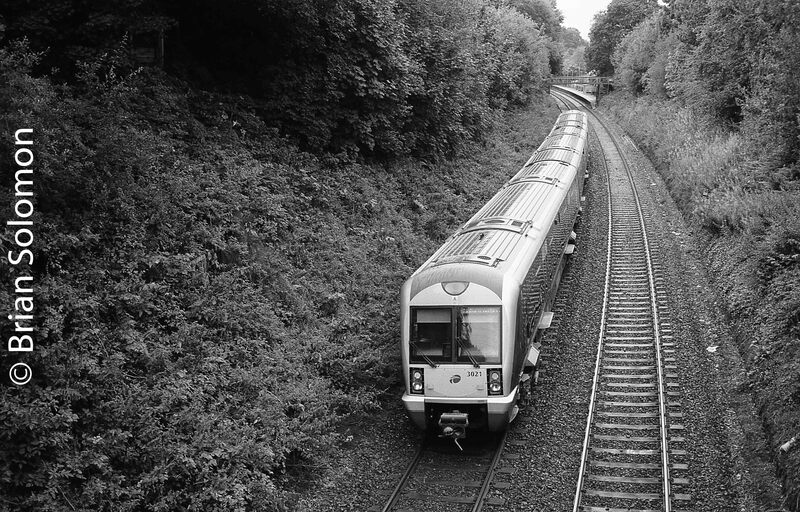 Northern Ireland Railways at Helen’s Bay. Here’s another case of when the station isn’t a station. The classic old stone station building at Helen’s Bay, County Down is now a salon. 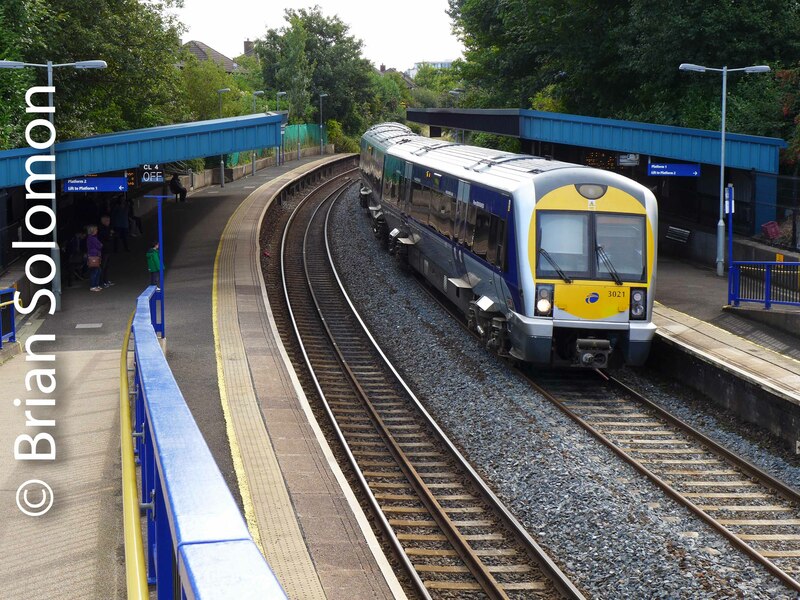 The platforms still serve the railway though. Exposed digitally using a FujiFilm XT1 with Zeiss 12mm Touit lens. NIR 4006 bound for Bangor glides into Helen’s Bay. 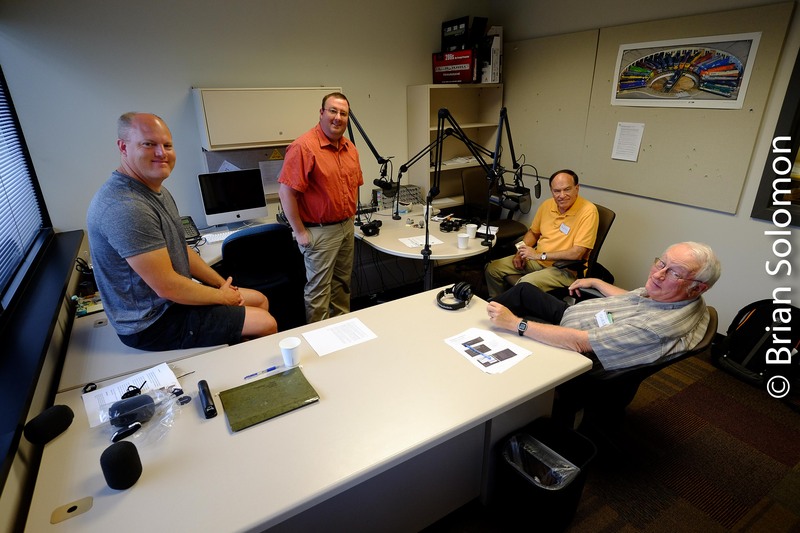 Latest Trains Podcast is Live—Conway Scenic with Dave Swirk. 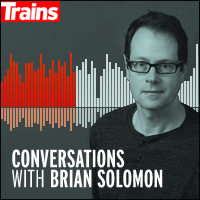 My latest podcast conversation, the fifth in a series with Trains Magazine, is now live. 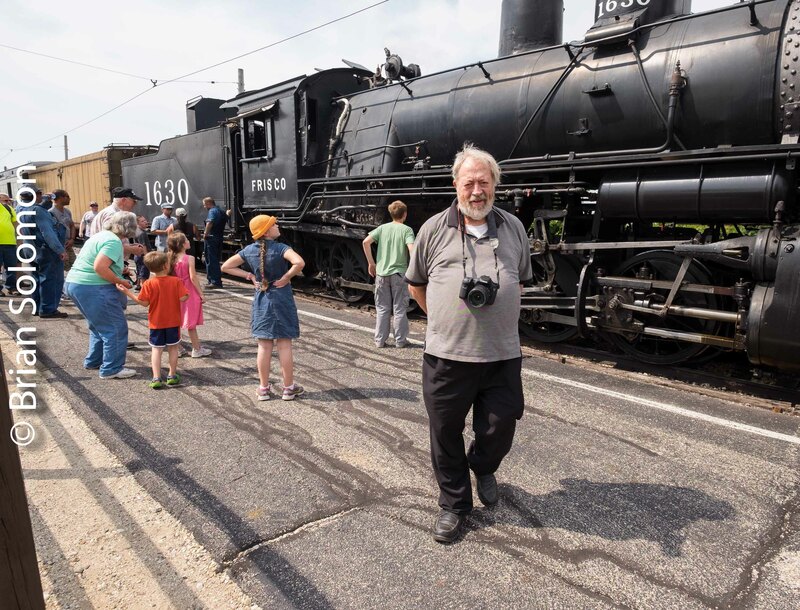 This summer I had discussion with Conway Scenic’s Dave Swirk about his plans and visions for the railroad. 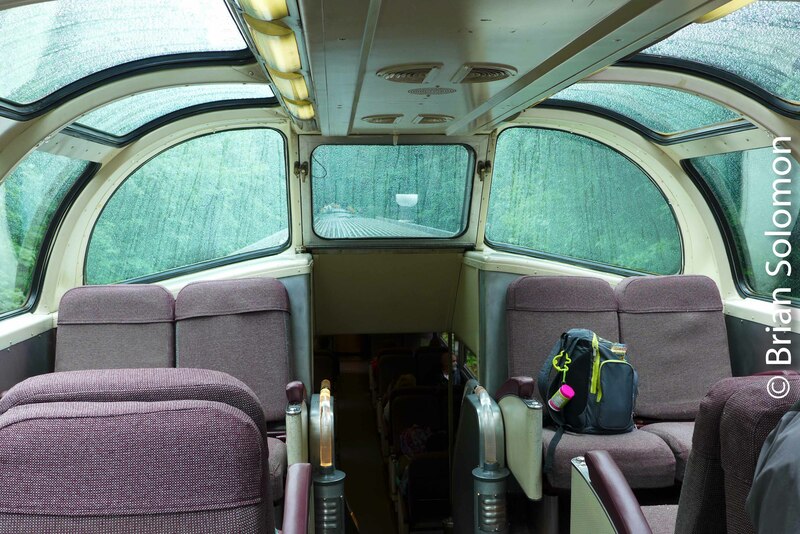 View of the dome on Conway Scenic’s Notch Train. 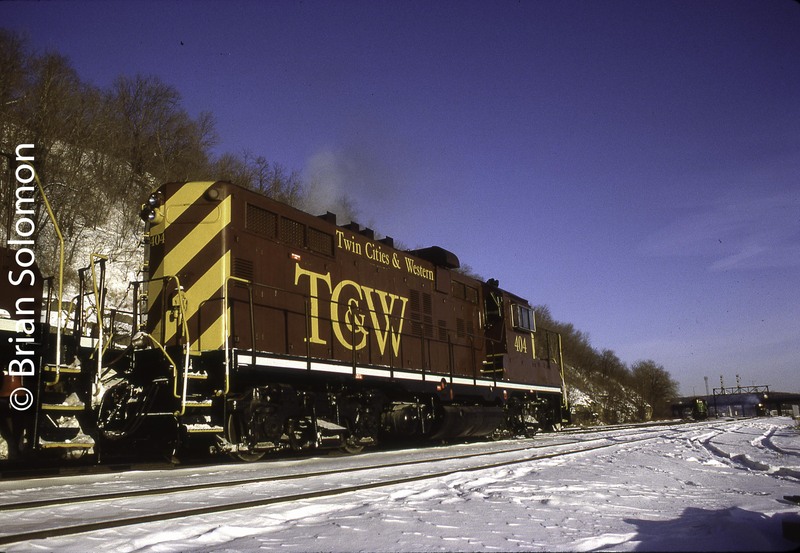 Boston & Maine F7A 4268 is among the locomotives resident at Conway Scenic. 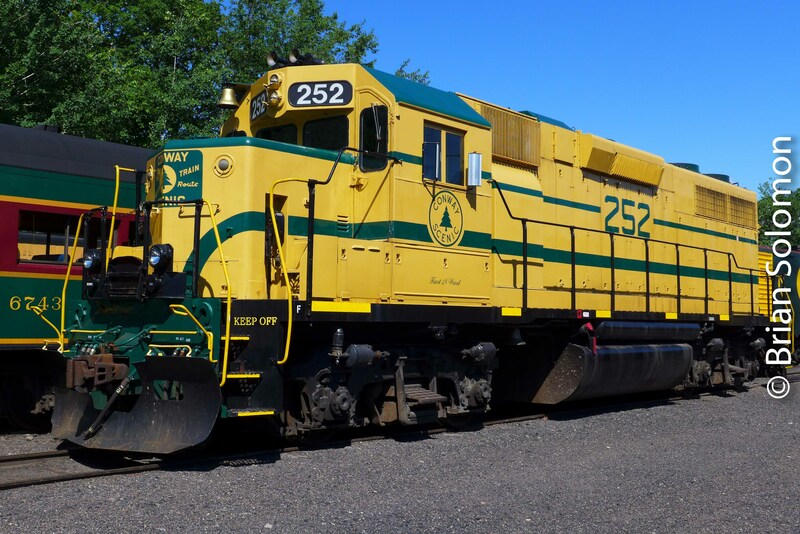 Maine Central 252 looks good in the morning sunshine at North Conway, New Hampshire. 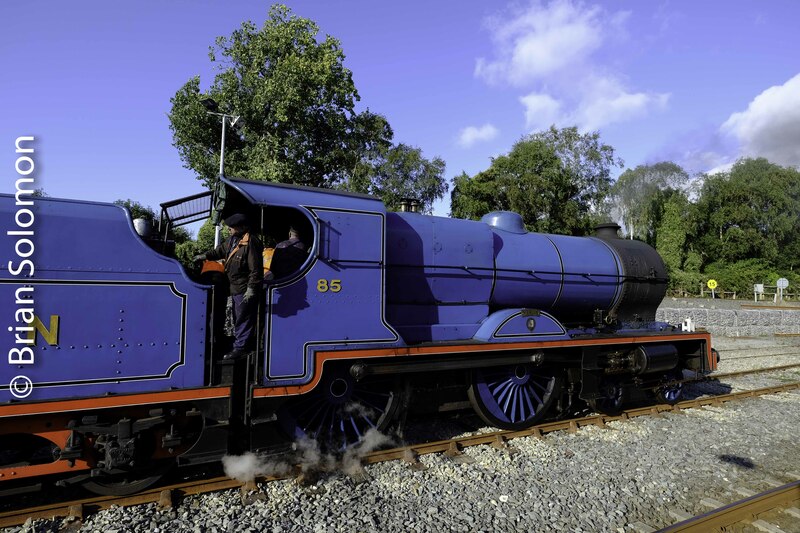 Great Northern Railway 85 at Killarney. 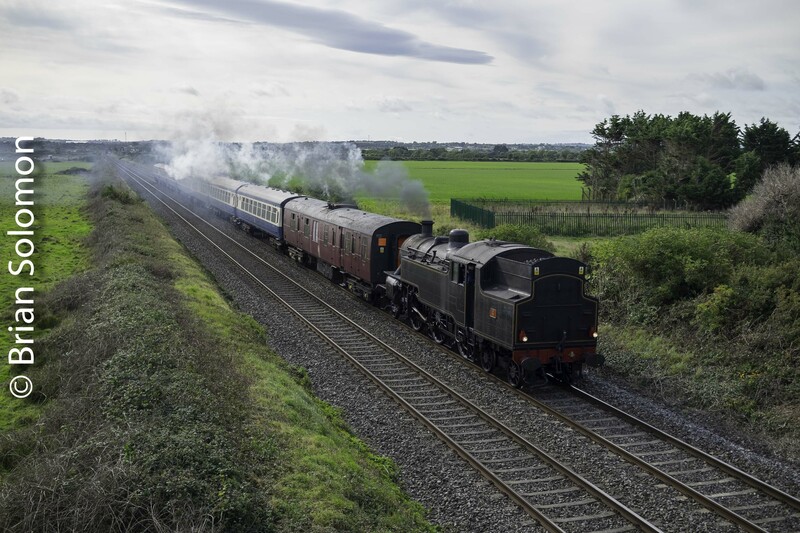 The Railway Preservation Society of Ireland operated a steam charter last week using former Great Northern Railway engine 85 Merlin. 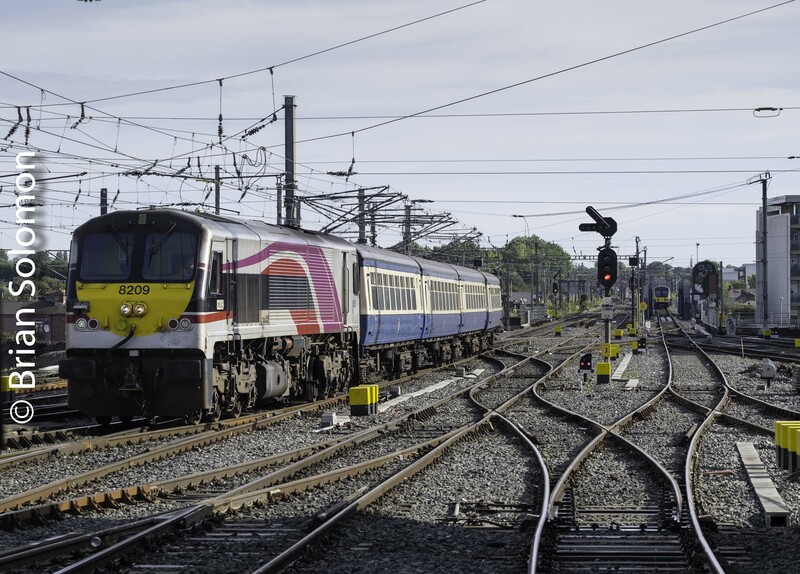 Rich afternoon sun and a colourful train made for easy photos at Killarney on 3 September 2018. These views were among the digital photos I exposed with my FujiFilm XT1. I was playing with scale and focus while working with the light to make the most of shadows. 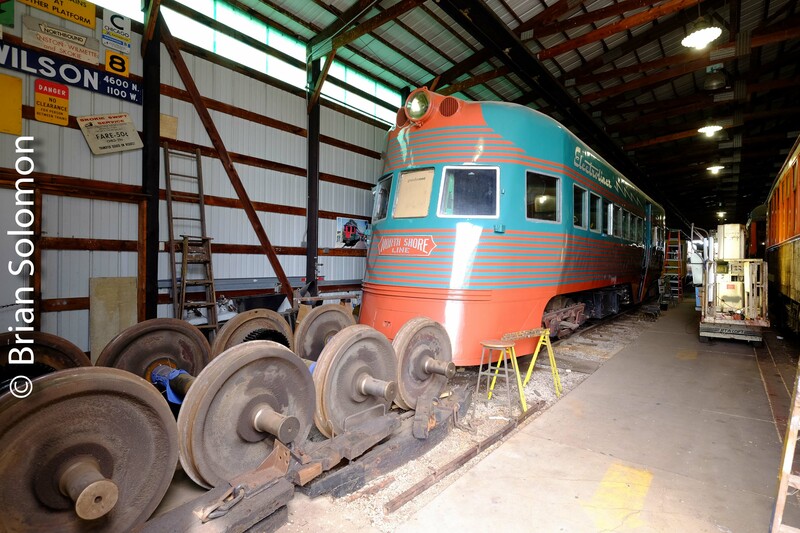 The Illinois Railway Museum (IRM) is a wonderful repository of American railway equipment and artifacts. 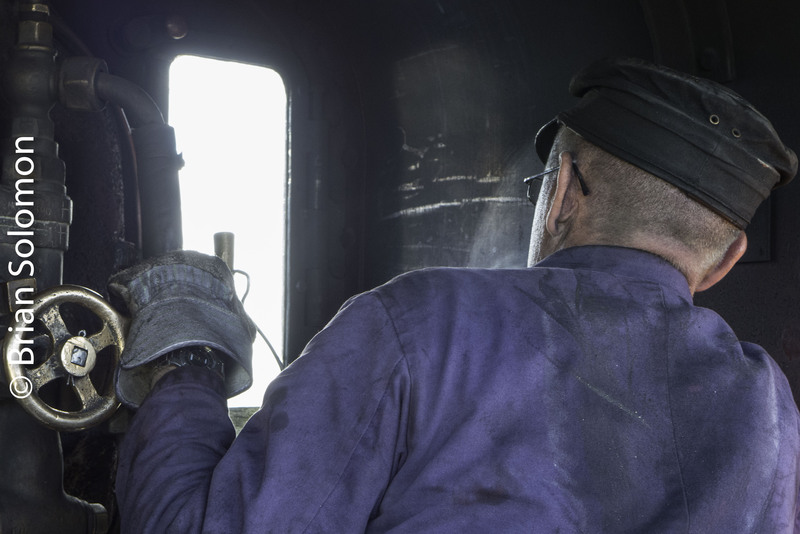 Last month, photographer John Gruber and I spent a couple of hours wandering around, photographing and traveling on IRM’s preserved trains. 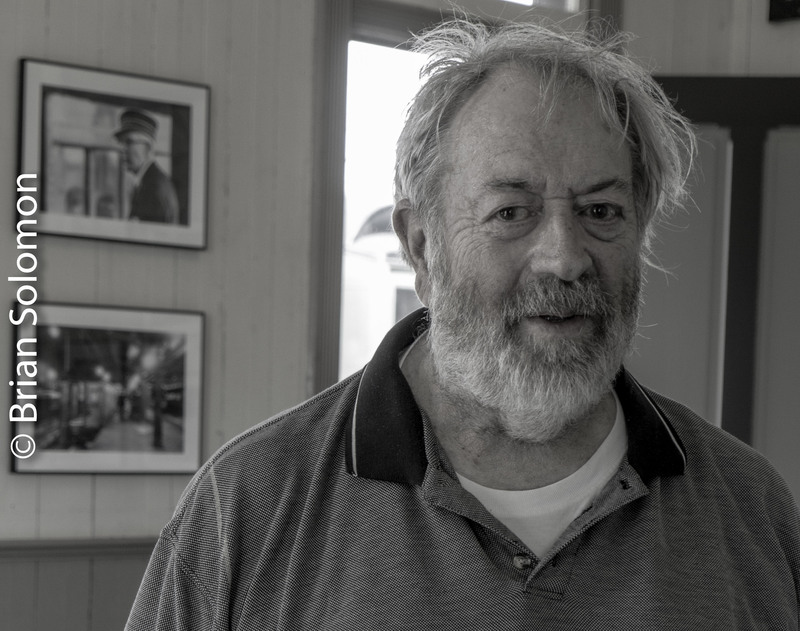 John has an on-going exhibit of his finest Chicago, North Shore & Milwaukee photographs in IRM’s East Union station. He asked if I could make a few photos of him surrounded by his photography. Lumix LX7 digital photo, partially desaturated for effect. 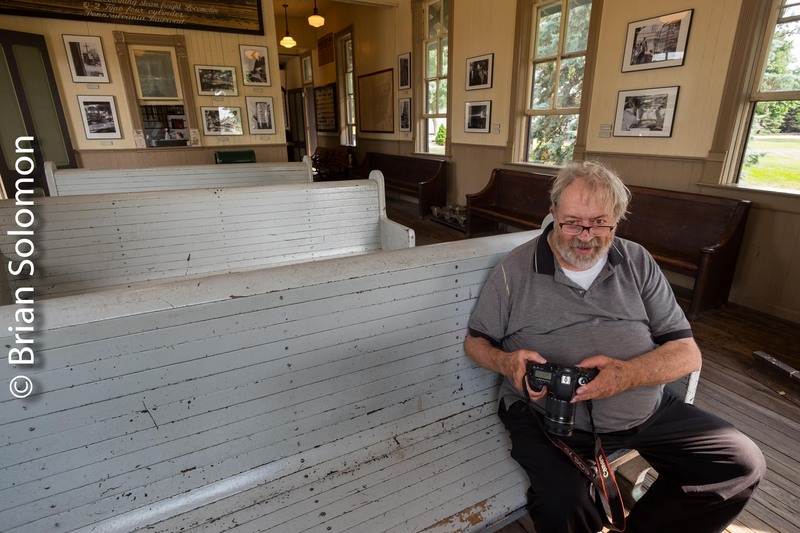 John Gruber surrounded by his North Shore photos at the East Union station. Frisco 2-10-0 1630 made a cameo appearance. 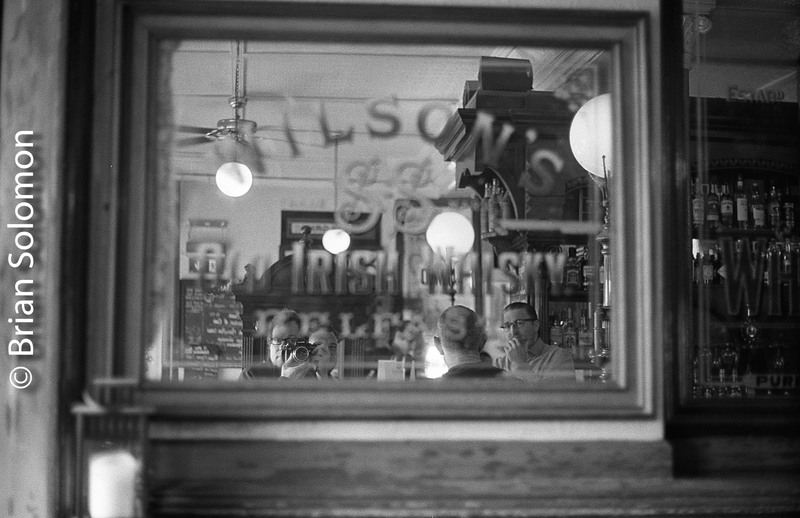 Back in the day, John worked with an iconic Nikon F single lens reflex. Today, he carries a Canon EOS 7D. Both have served him well. Right John? 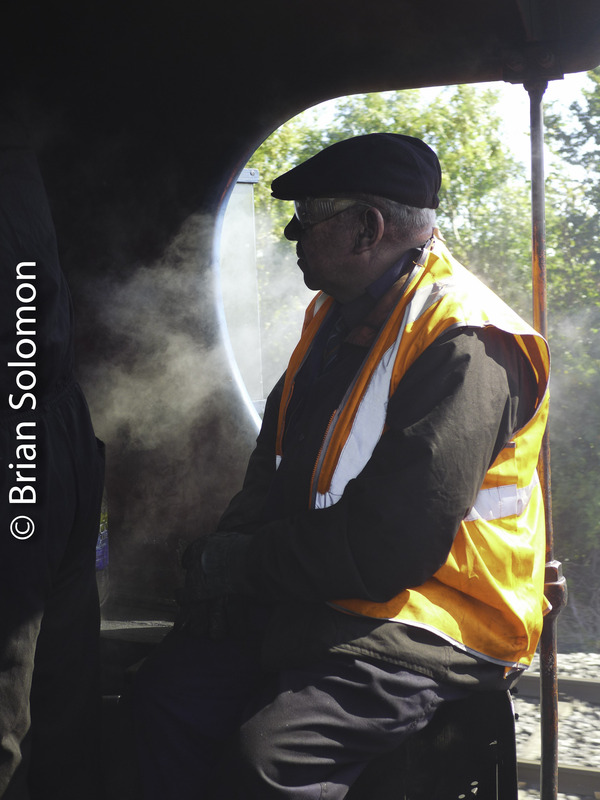 As we were leaving we crossed paths with Trains Magazine editor, Jim Wrinn. Jim Wrinn greets John Gruber. 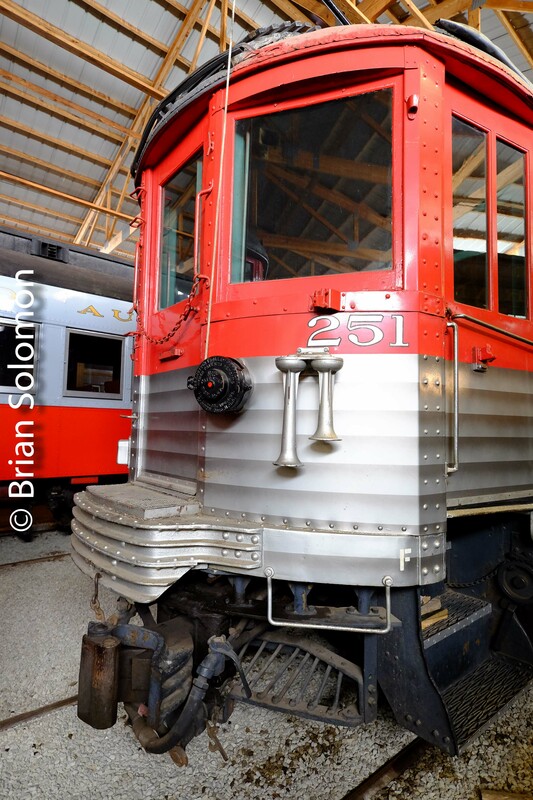 If you are planning a trip to Illinois Railway Museum, be sure to check John’s photos! 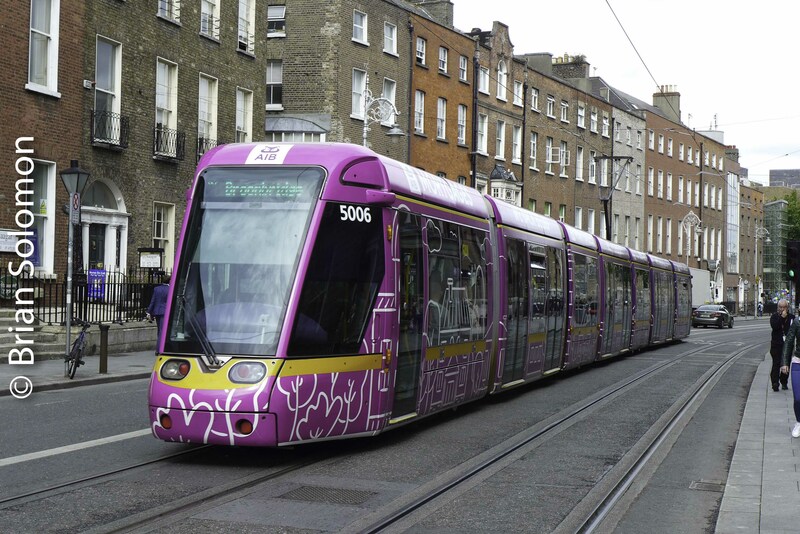 There’s a purple tram prowling Dublin’s Green Line. 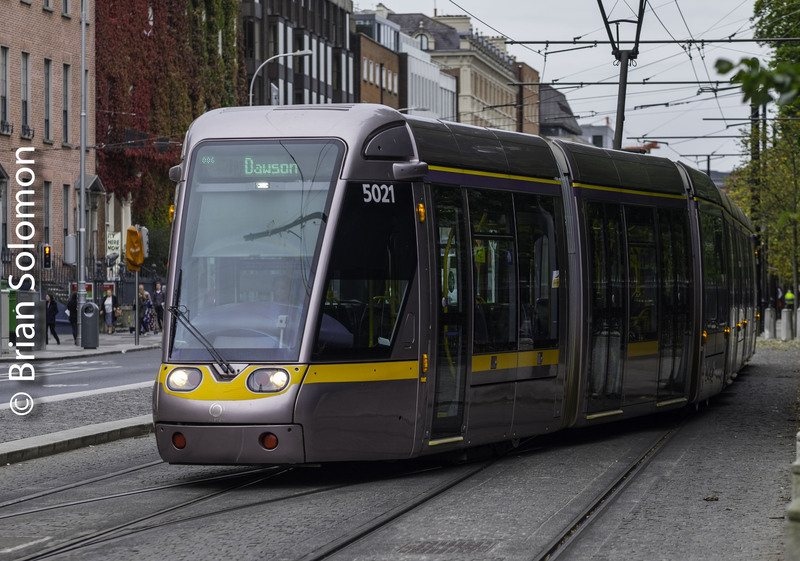 The other day I was on my way over to John Gunn’s Camera Shop on Wexford Street and I made these photos with my Lumix LX7 of LUAS trams gliding along Harcourt Street. This is a perfect place to pose modern Citadis trams against a backdrop of Georgian Terrace houses. To compensate for flat lighting, with two of these three images I made some minor manipulations in post processing to boost sky detail, lighten shadows and improve contrast. That means one of the images is simply the unaltered camera-JPG. Can you guess which one that is? 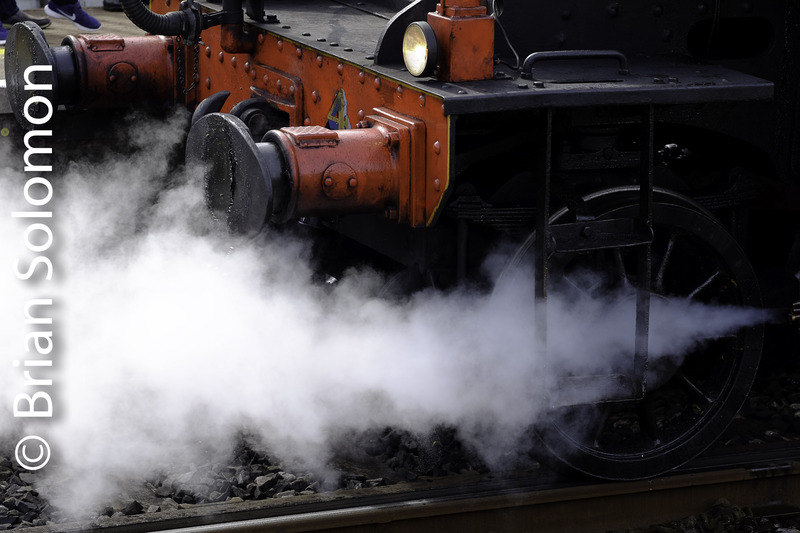 Old School: Steam and Coal Dust. 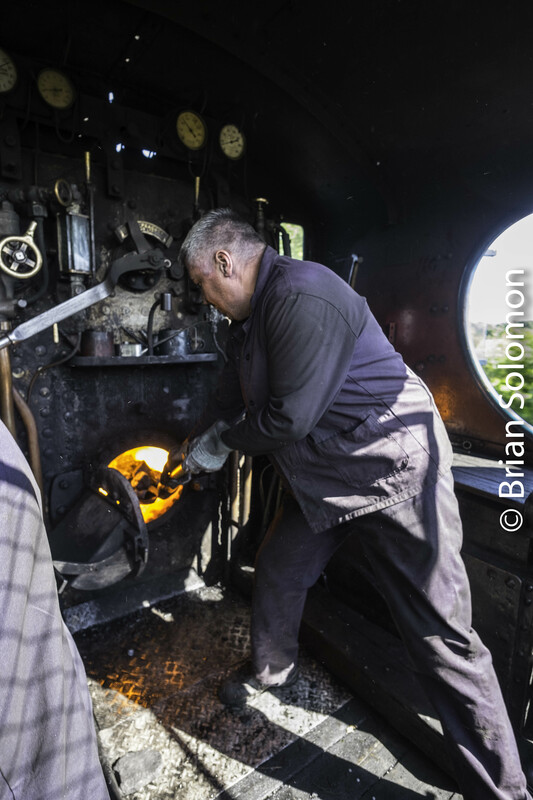 What better place to work with black & white film than on the locomotive footplate? 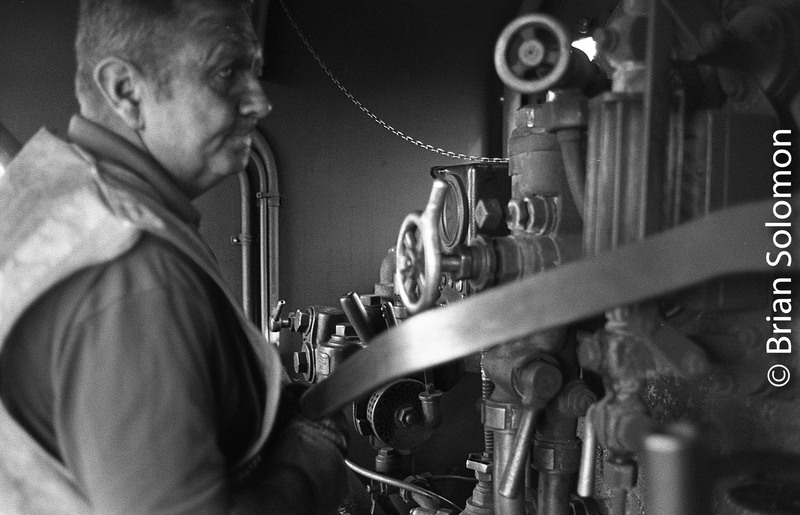 Last week, I made these steam portraits and views of Railway Preservation Society of Ireland’s engine 85 at work using my battle worn Nikon N90S with f2.0 35mm lens loaded with Kodak Tri-X. Processing the film was the tricky part. I did this by hand the old fashioned way. To make the most of highlight and shadow detail, I used multiple-stage split-development, followed by selenium toning to give highlights the silvery edge. 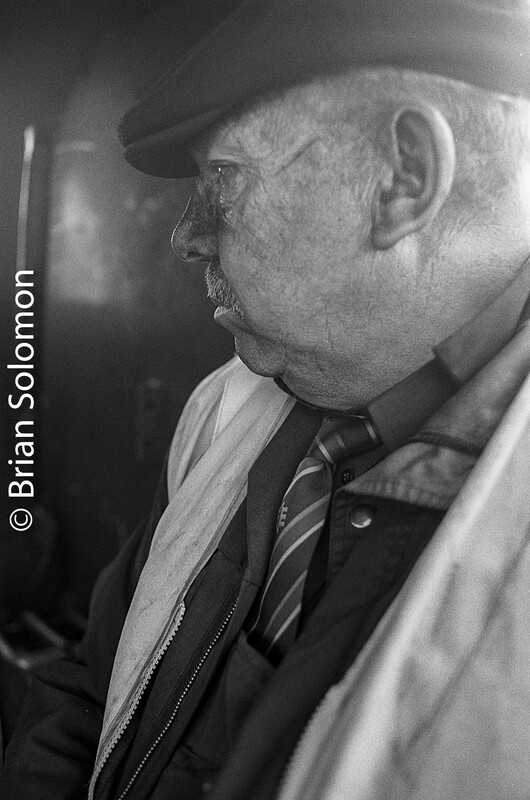 After processing, I scanned the negatives using an Epson V500 flatbed scanner. So in the end presentation my silver photos are digital after all. 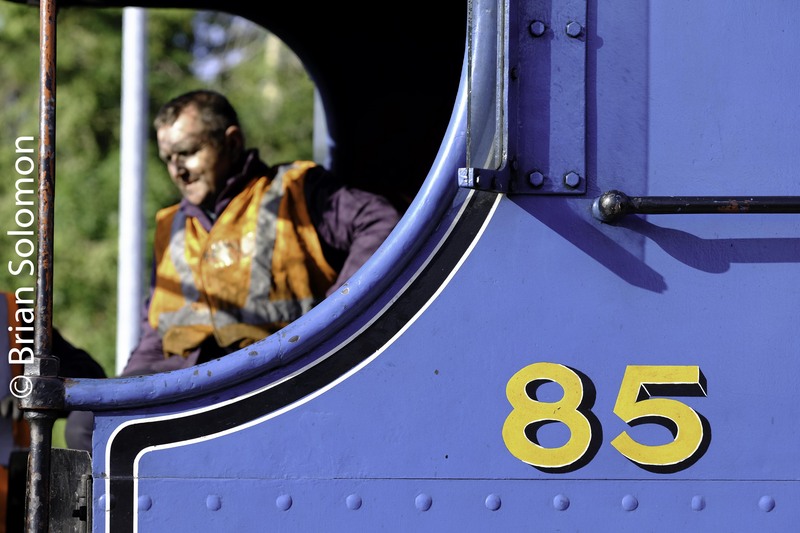 Bad Luck with the Belmond! 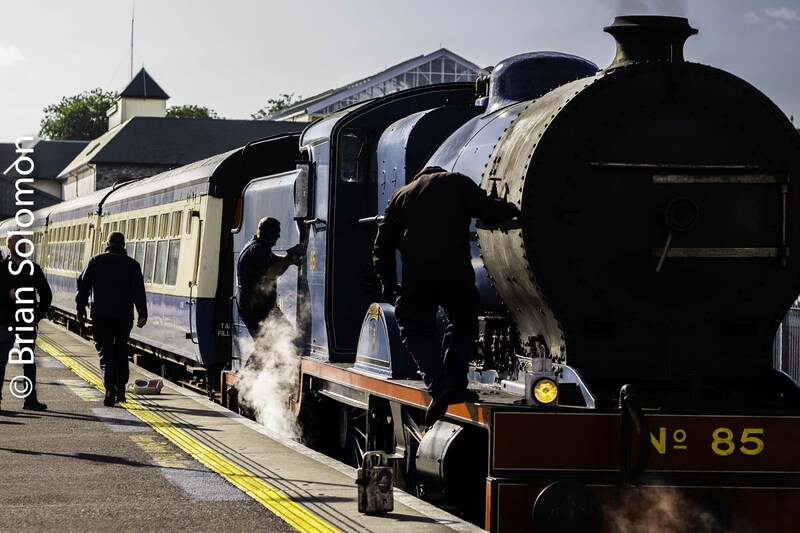 Two Sunday Mornings in a row I walked up to the line with an aim of catching an 071 class locomotive in heritage paint leading Belmond’s Grand Hiberniancruise train on its run from Dublin Connolly to Waterford. 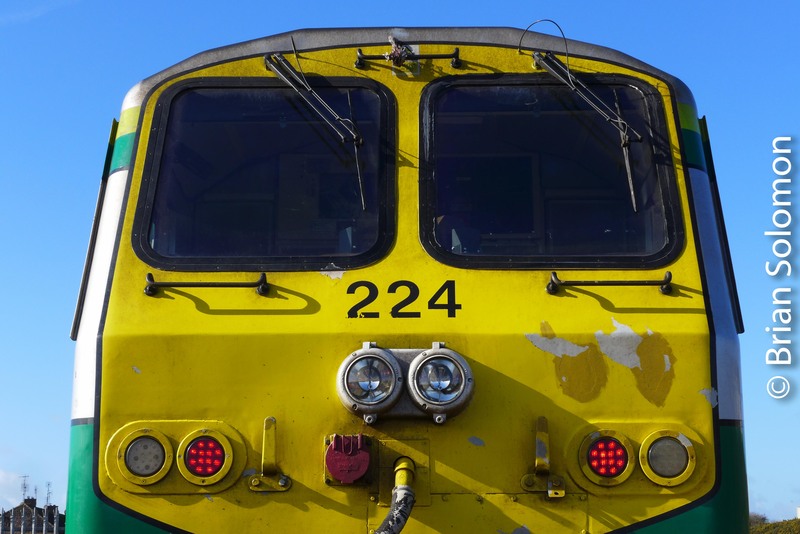 Two Sundays, two locations, two heritage locomotives (numbers 073 and 071 respectively), and two different Irish Rail scheduled trains that got in my way. In both instances, I came away with different photos than I’d set out to make. 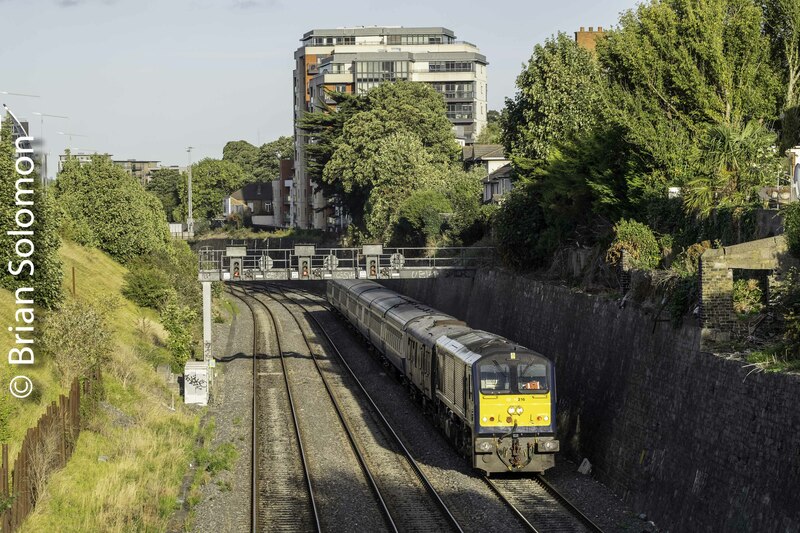 Irish Rail 073 leads Belmond’s Grand Hibernian in Dublin on 2 September 2018. 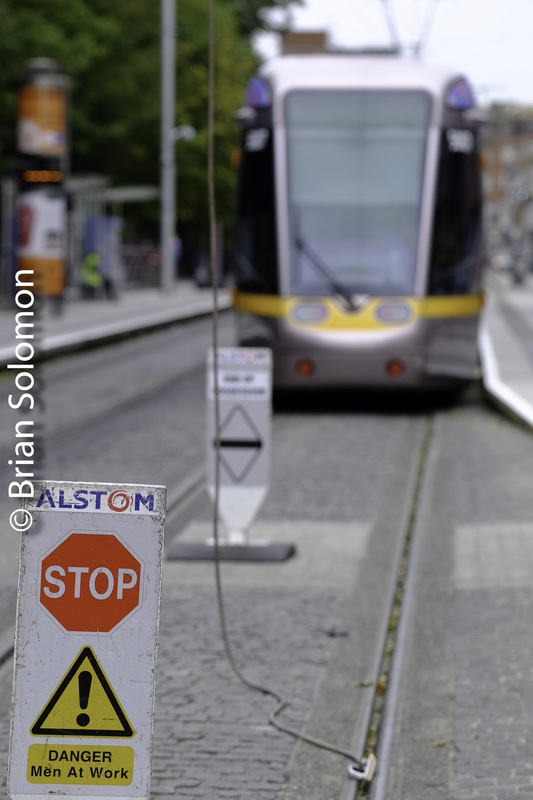 An Irish Rail intercity rail car destined for Heuston Station is stopped at a red signal. Bad luck! 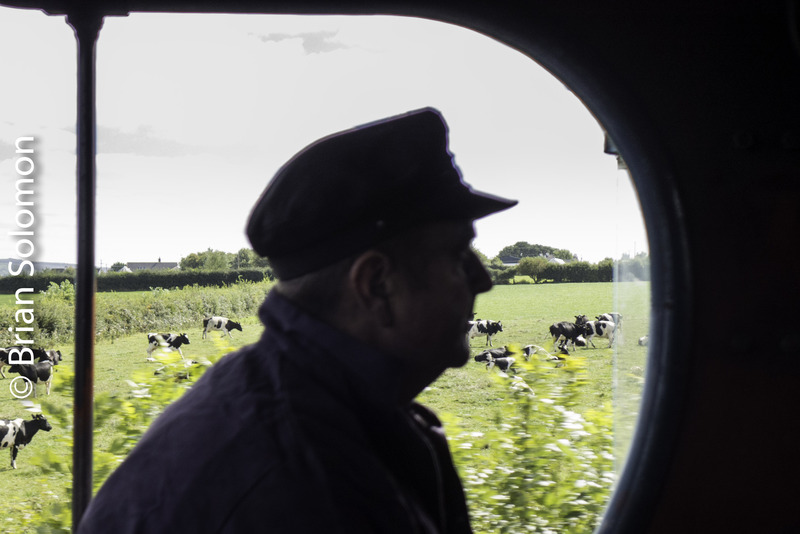 The Belmond train was running a few minutes behind the advertised. Bright sun, fluffy clouds, elevation, all the elements for a calendar perfect image. Oh no, an ICR! Shoo shoo! Well, that didn’t work out as hoped! But then again, I have a zillion photos here anyway. My question: might these photos age well? Perhaps the intrusion of the ROTEM ICRs may make these photographs more interesting in years to come? I’m not one to get overly excited when a photo opportunity doesn’t work as planned. Sometimes it’s best to just keep making photos when a scene plays out. PSSSST! (I also made some sneaky 35mm slides that may make the most of both situations). 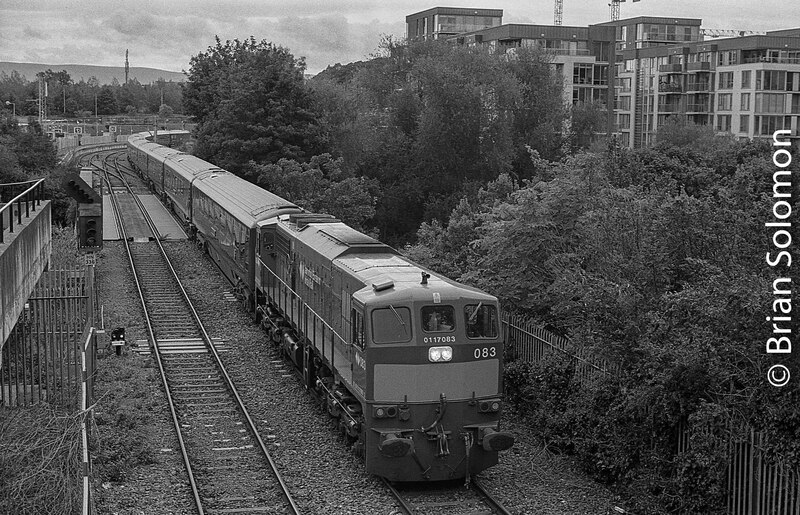 Irish Rail 079 leads RPSI Cravens. 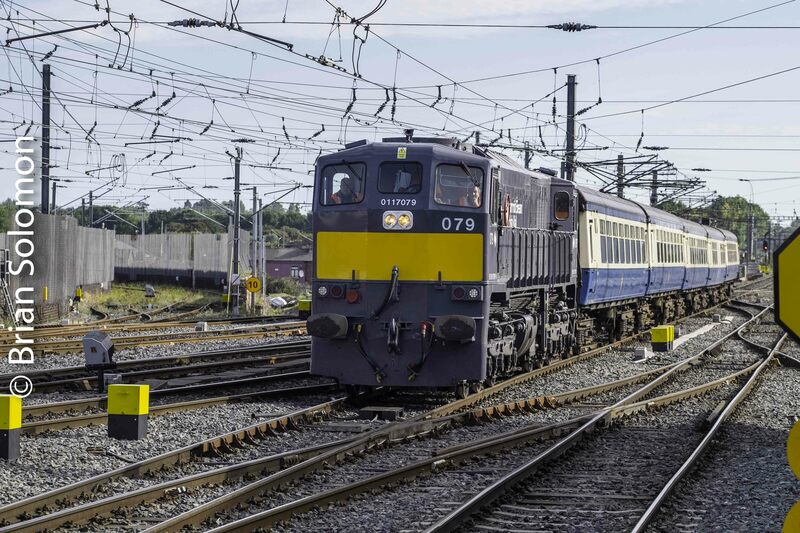 On Monday, 3 September 2018, Irish Rail 079 worked Railway Preservation Society of Ireland’s preserved Cravens carriages, running as an empty train from Dublin’s Inchicore Works to Connolly station. 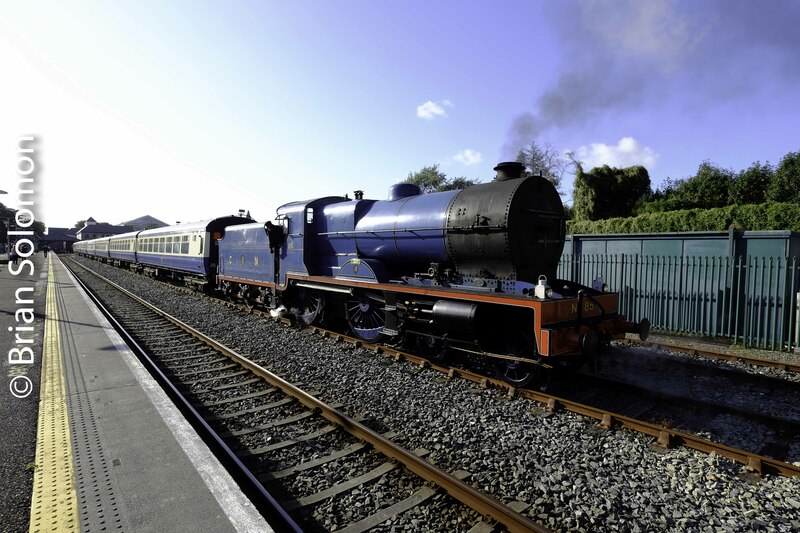 This was a scheduled move to position the heritage train for RPSI’s private charter to Killarney, County Kerry with steam locomotive 85 (featured in earlier Tracking the Light Posts). 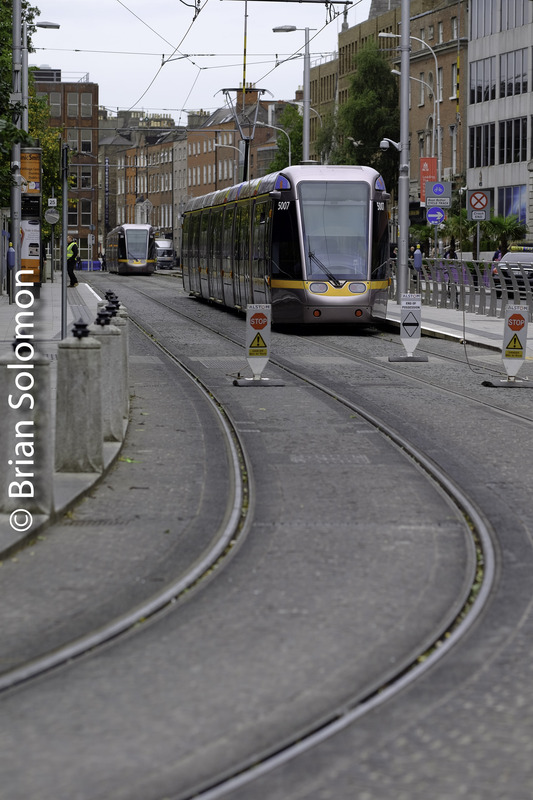 Working with my FujiFilm XT1 and 90mm lens, I photographed from the north end of Connolly platform 1 & 2. The train was slightly backlit. To compensate, I made nominal adjustment to the Fuji RAW file to lighten shadows in post processing, then exported as a scaled JPG for internet presentation. 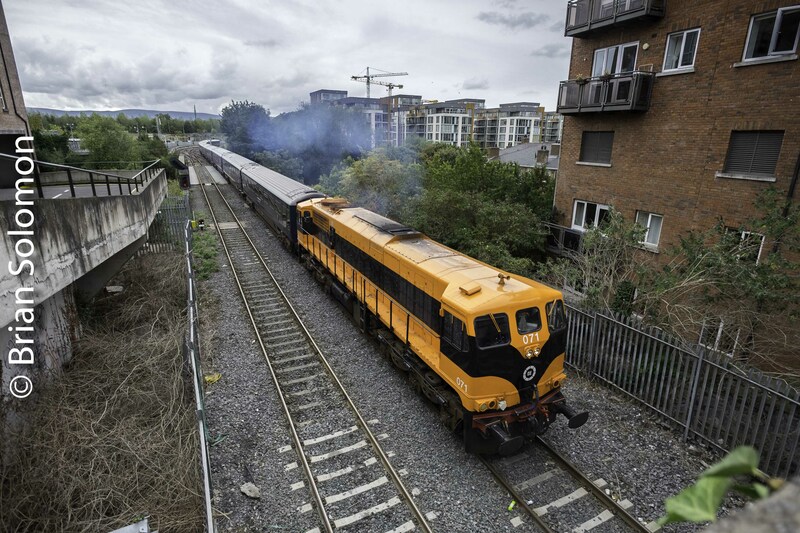 Irish Rail’s Ken Fox is at the throttle of General Motors-built class 071 number 079 approaching Dublin Connolly station. 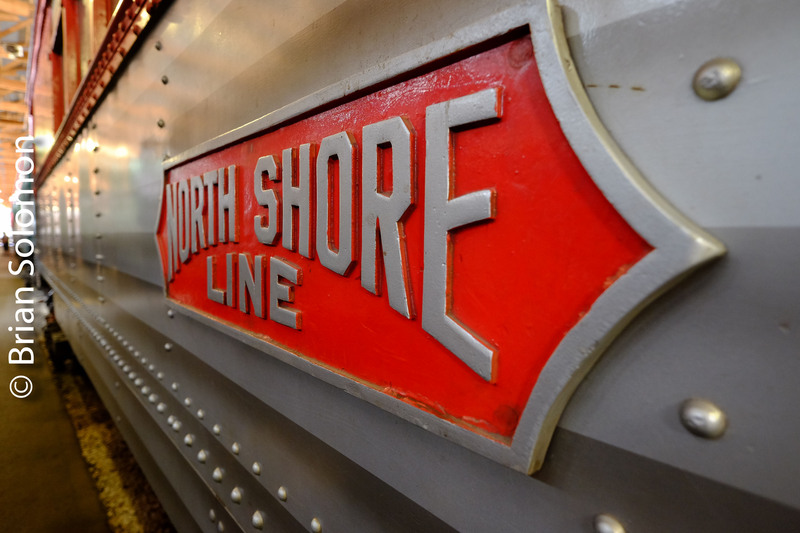 Ghosts of the North Shore—Five Photos. 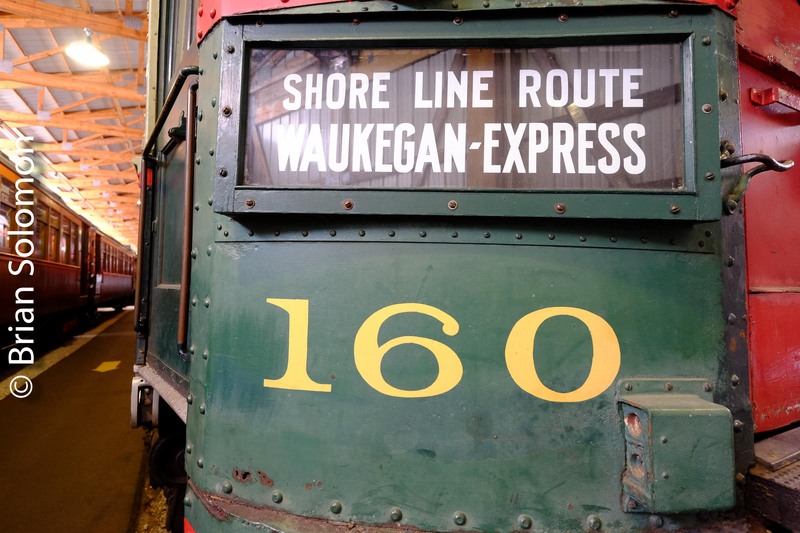 In the 1950s and 1960s, My father made a project of photographing the Chicago, North Shore & Milwaukee, the distinctive interurban electric line connecting it’s namesakes. 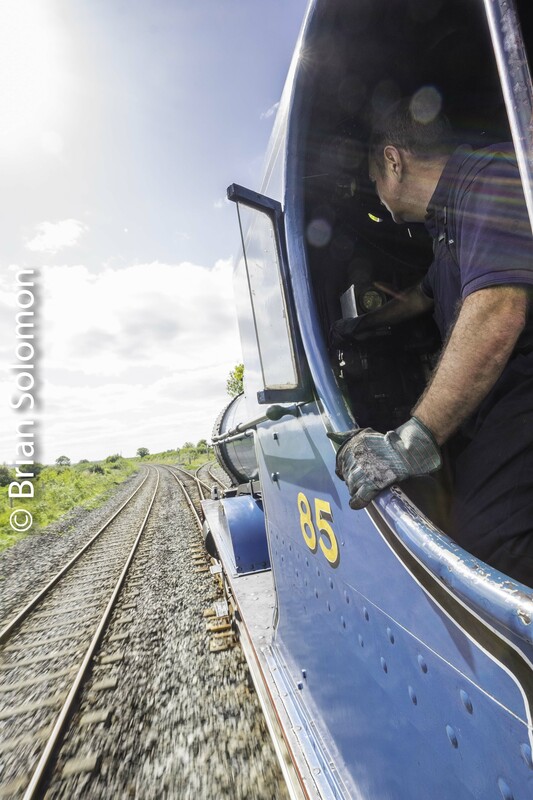 Last month, John Gruber and I paid a visit to the Illinois Railway Museum at Union, Illinois. Like my father, John had focused on the North Shore. 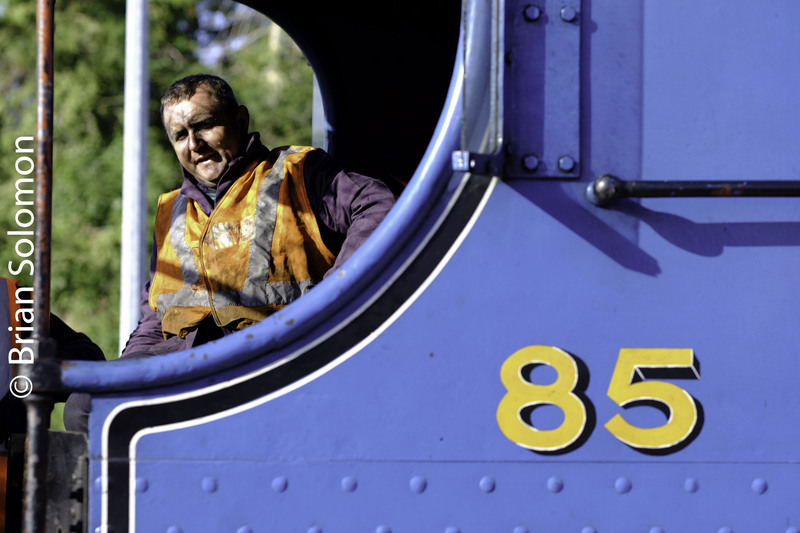 He made hundreds of excellent photographs that distilled the spirit of the railway. North Shore was before my time, but I feel that I know the line thanks to my dad’s and John’s photographs, which were featured in books by the late William D. Middleton. 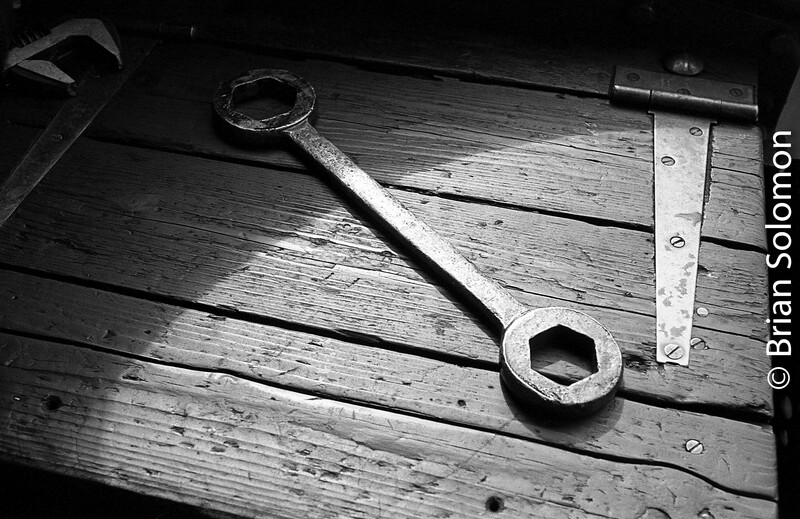 The railway may be gone 55 years, but key pieces of it’s equipment survive. 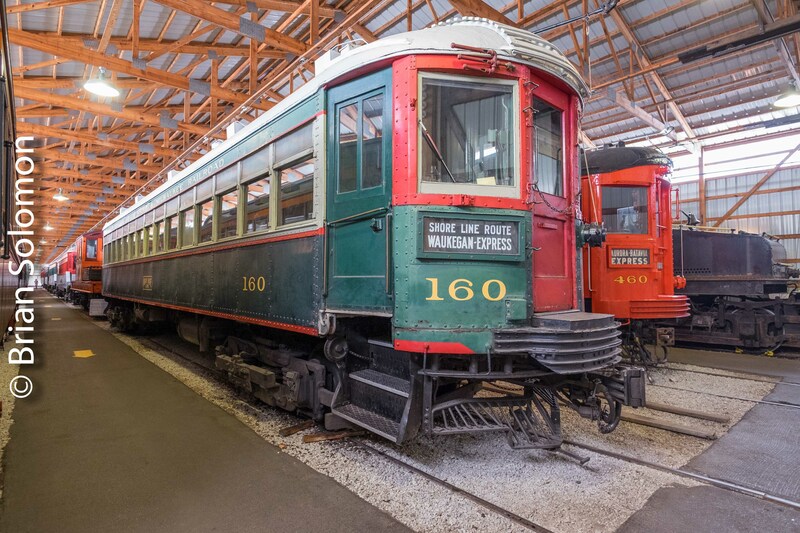 I made these digital views of preserved North Shore cars at IRM using my FujiFIlm X-T1 with 12mm Zeiss Touit lens. 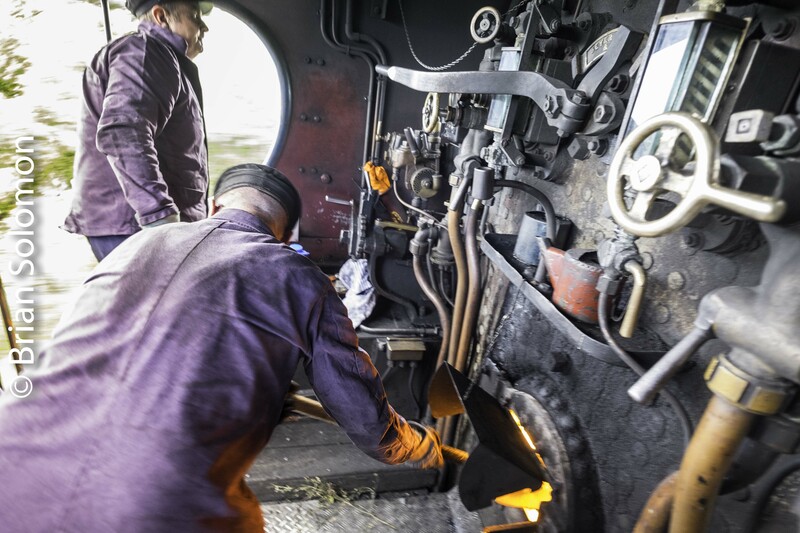 This flat-field super wide-angle lens is well suited to making images in the tight quarters of IRM’s car barns. 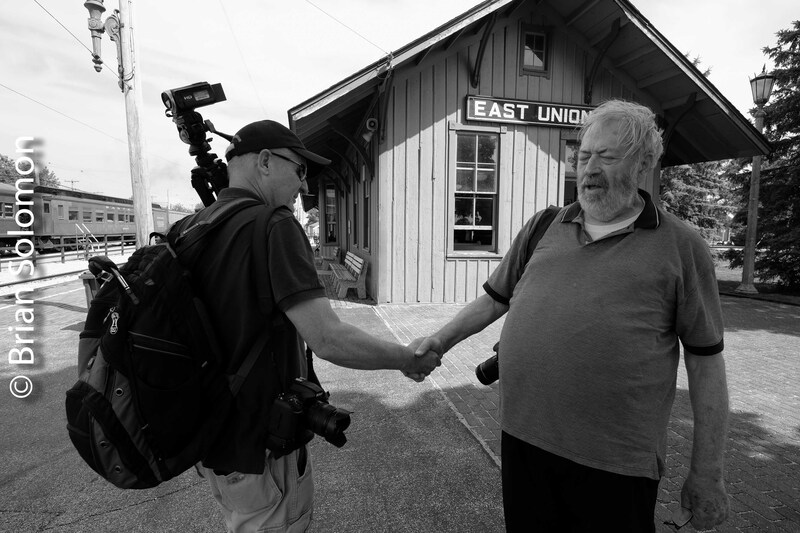 John Gruber has an on-going exhibit of his finest North Shore photography in the East Union Station at IRM. This will be subject of another Tracking the Light post. 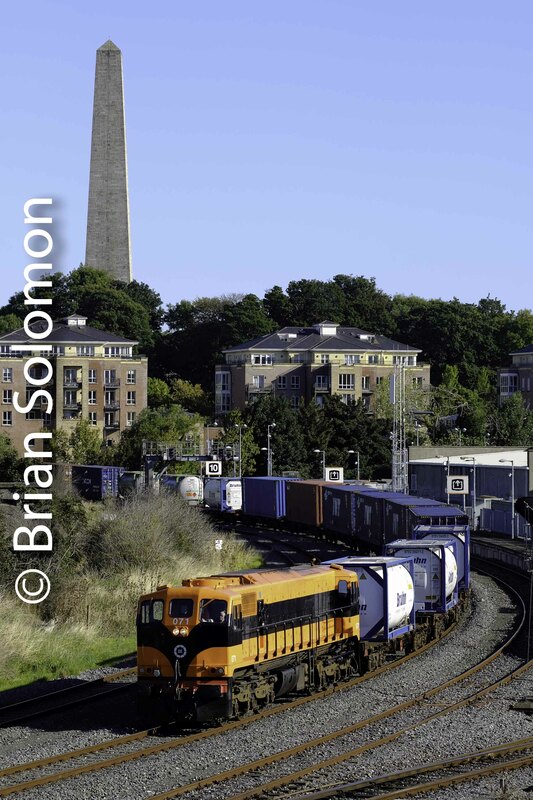 NI Railways at Botanic, Belfast. 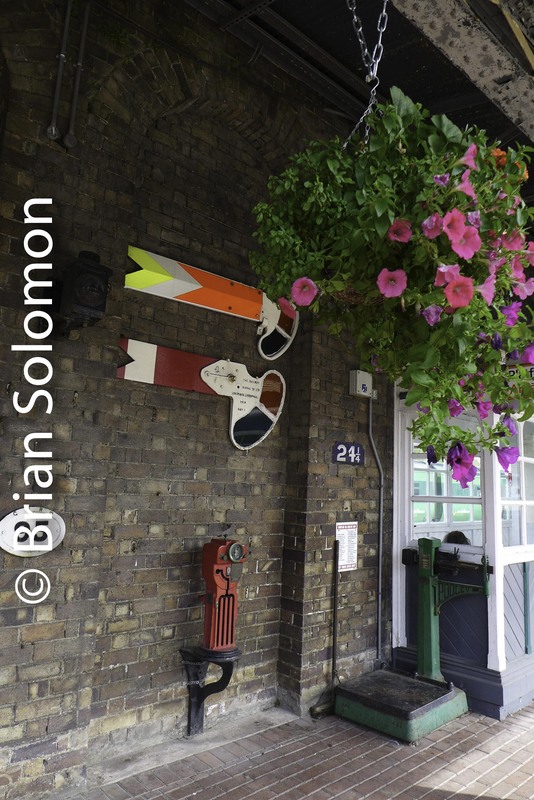 Sometimes a station name conveys a grander image than what’s really there. Cherry Orchard in Dublin comes to mind. Put out visions of lush blossoming trees in a bucolic pastoral setting, and replace it with industrial squalor, palisade fencing, graffiti and garbage. Yet, it’s still a good place to catch trains on the move. 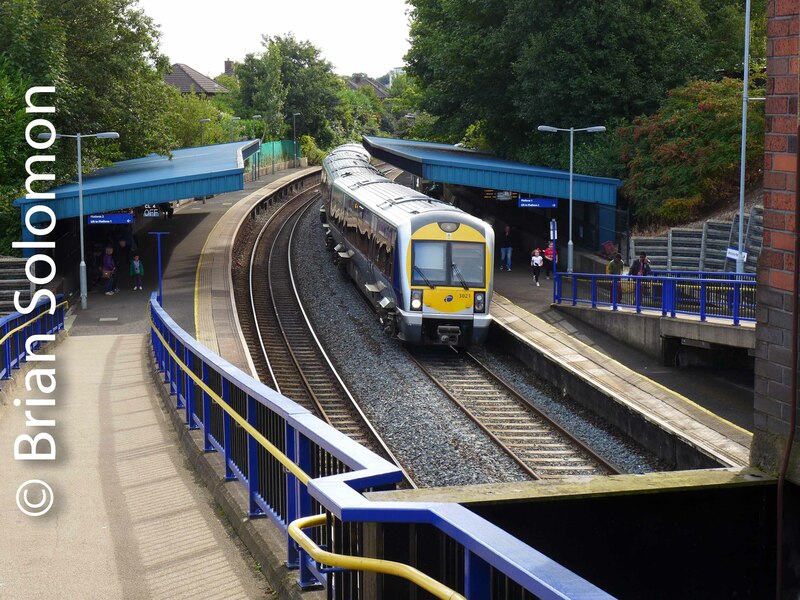 Then we have today’s featured location: NI Railway’s modern station at Botanic in Belfast. For me the name invokes images of flowing beautiful gardens, tall majestic trees and rows of manicured flowers, perhaps a fountain. While more salubrious than Dublin’s Cherry Orchard (and undoubtedly safer too), Botanic isn’t a wonderland. But it’s not a bad place to picture trains. Here’s a couple of Lumix Views. Lumix LX-7 view, August 2018. 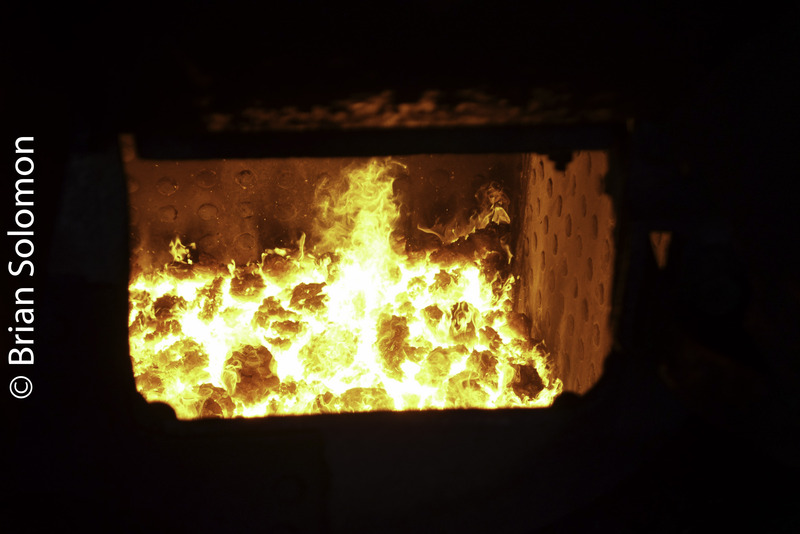 Great Northern Compound Under Steam at Portarlington—Five Photos! 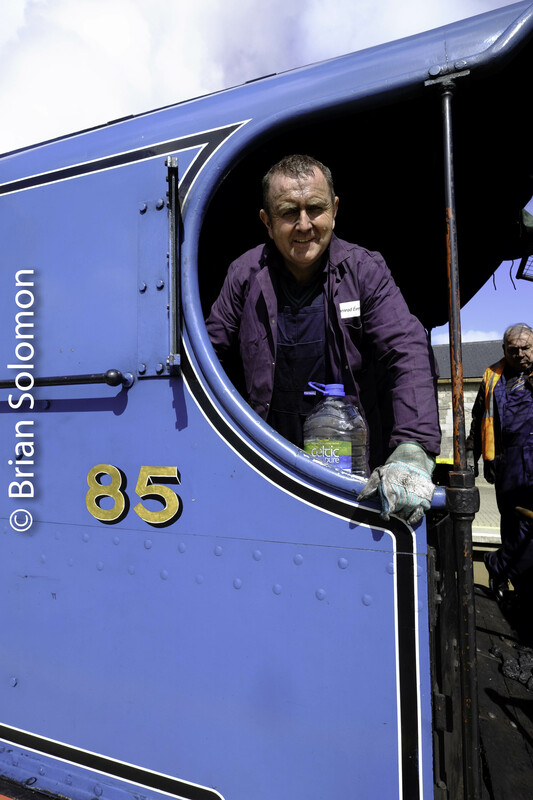 Yesterday (3 September 2018), sunny skies greeted Great Northern Railway Ireland 85, a 4-4-0 three-cylinder compound locomotive operated by Railway Preservation Society of Ireland, when it paused at Portarlington, County Laois to take water. 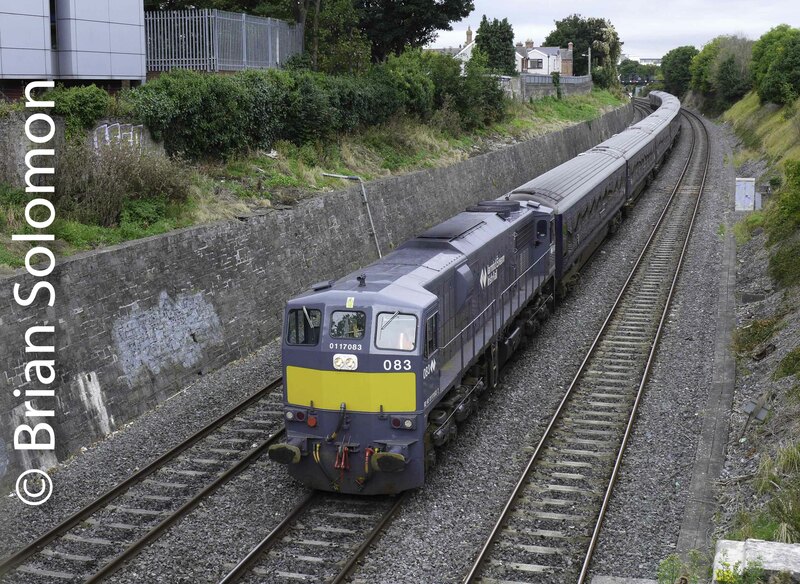 This classic Irish express passenger locomotive was working a chartered train from Dublin Connolly to Killarney. 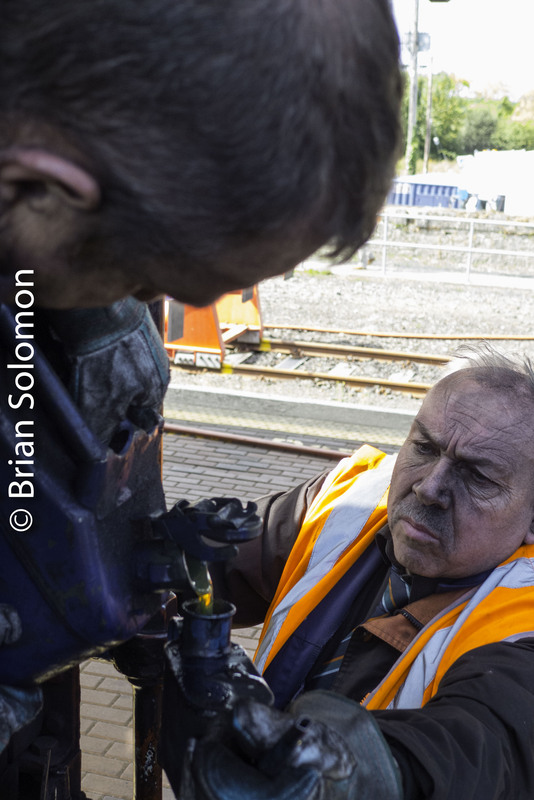 I exposed these images using my FujiFilm XT1 fitted with 12mm Zeiss Touit lens. The photos here were scaled without modification from camera JPG files using the Velvia color profile. An active contrast of modern and antique at Portarlington. 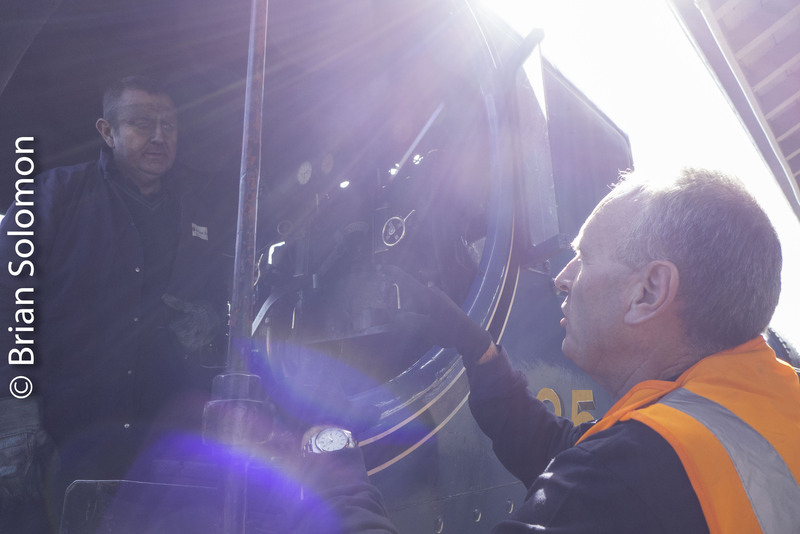 85’s safety valves lift making for an awesome sight. Driver Ken Fox and his crew made a great run from Dublin. I also made a few colour slides on real FujiFilm: Provia 100F. 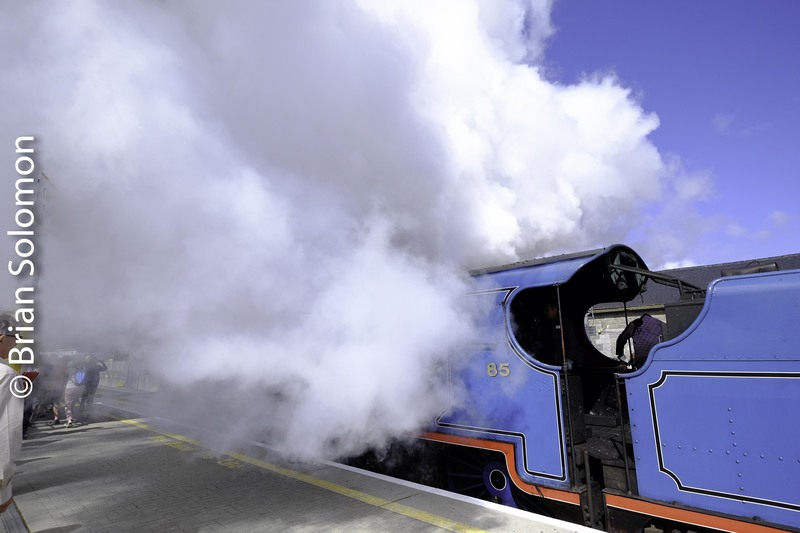 Stay tuned for more steam photos! Including: Room with a View. 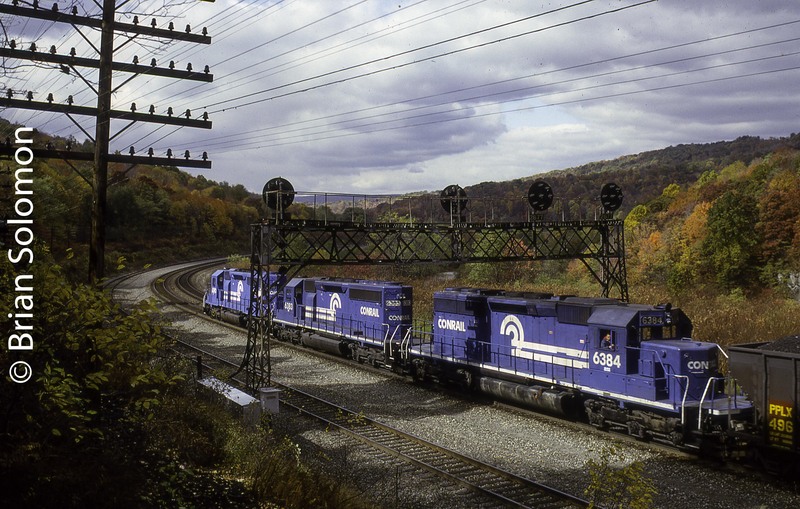 Modern American Railroading in Soft Light. 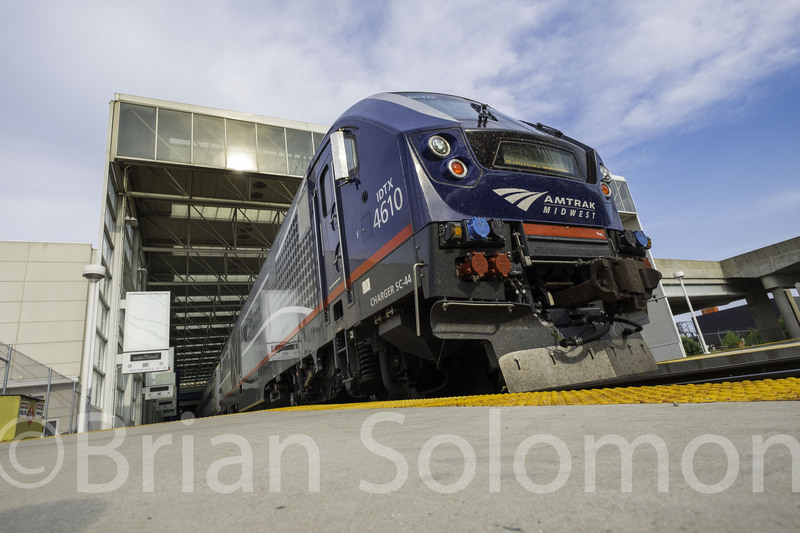 Here’s a thoroughly today scene: An Amtrak Midwest Siemens Charger at Milwaukee’s Intermodal Terminal. Diffused afternoon sun works well with the geometry of the station’s architecture and the curves and lines of the Siemens Charger. 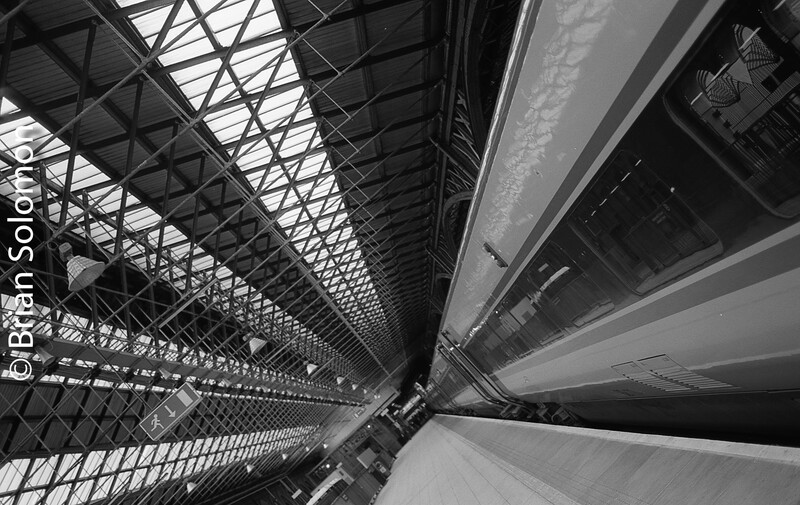 Using my FujiFilm X-T1 fitted with a 12mm Zeiss Touit, I opted for a skewed angle that accentuates this modern scene. In post processing, I adjusted contrast and color balance.